Actin-related protein 2/3 (Arp2/3) complex activation by nucleation promoting factors (NPFs) such as WASP, plays an important role in many actin-mediated cellular processes. In yeast, Arp2/3-mediated actin filament assembly drives endocytic membrane invagination and vesicle scission. Here we used genetics and quantitative live-cell imaging to probe the mechanisms that concentrate NPFs at endocytic sites, and to investigate how NPFs regulate actin assembly onset. Our results demonstrate that SH3 (Src homology 3) domain-PRM (proline-rich motif) interactions involving multivalent linker proteins play central roles in concentrating NPFs at endocytic sites. Quantitative imaging suggested that productive actin assembly initiation is tightly coupled to accumulation of threshold levels of WASP and WIP, but not to recruitment kinetics or release of autoinhibition. These studies provide evidence that WASP and WIP play central roles in establishment of a robust multivalent SH3 domain-PRM network in vivo, giving actin assembly onset at endocytic sites a switch-like behavior. Actin is one of the most abundant proteins in yeast, mammalian and other eukaryotic cells. It assembles into long chains known as filaments that the cell uses to generate forces for various purposes. For example, actin filaments are needed to pull part of the membrane surrounding the cell inwards to bring molecules from the external environment into the cell by a process called endocytosis. In yeast, a member of the WASP family of proteins promotes the assembly of actin filaments around the site where endocytosis will occur. To achieve this, WASP interacts with several other proteins including WIP and myosin, a motor protein that moves along actin filaments to generate mechanical forces. However, it was not clear how these proteins work together to trigger actin filaments to assemble at the right place and time. Sun et al. addressed this question by studying yeast cells with genetic mutations affecting one or more of these proteins. The experiments show that WASP, myosin and WIP are recruited to sites where endocytosis is about to occur through specific interactions with other proteins. For example, a region of WASP known as the proline-rich domain can bind to proteins that contain an “SH3” domain. WASP and WIP arrive first, stimulating actin to assemble in an “all and nothing” manner and attracting myosin to the actin. Further experiments indicate that WASP and WIP need to reach a threshold level before actin starts to assemble. The findings of Sun et al. suggest that WASP and WIP play key roles in establishing the network of proteins needed for actin filaments to assemble during endocytosis. These proteins are needed for many other processes in yeast and other cells, including mammalian cells. Therefore, the next steps will be to investigate whether WASP and WIP use the same mechanism to operate in other situations. Nucleation-promoting factors (NPFs) activate the actin-related protein 2/3 (Arp2/3) complex to assemble actin filaments, which are important in many cellular processes, such as morphogenesis, cell motility and endocytosis (Badour et al., 2003; Campellone and Welch, 2010; Rottner et al., 2010). Moreover, NPF-mediated actin nucleation can be co-opted by pathogens to mediate infection and spread (Welch and Way, 2013). How NPF activity is regulated in a spatiotemporal manner in cells is an important open question. In addition to VCA motifs (composed of a Verprolin homology domain, Central hydrophobic region, and Acidic region) that directly stimulate Arp2/3 complex-mediated actin nucleation, NPFs often contain additional functional elements that mediate interactions with other proteins (Padrick and Rosen, 2010; Takenawa and Suetsugu, 2007). For example, the EVH1 domain (Ena/VASP homology) of N-WASP (Neural Wiskott-Aldrich Syndrome protein) interacts with WIP (WASP-interacting protein) (Donnelly et al., 2013; Rivera et al., 2004; Tehrani et al., 2007). In addition, most WASP family proteins, which are the best-studied NPFs, also contain a large proline-rich domain (PRD) that contains multiple Src homology 3 (SH3)-binding proline-rich motifs (PRMs). Previous studies demonstrated that dozens of SH3-domain containing ligands can bind to WASP PRMs, and that some enhance WASP NPF activity (Donnelly et al., 2013; Padrick and Rosen, 2010; Rivera et al., 2004; Tehrani et al., 2007). Multivalent PRM-SH3 domain interactions between N-WASP and its ligands enable proteins to form higher order complexes in vitro on artificial membranes and undergo a phase separation, producing micrometer-size clusters (Banjade and Rosen, 2014; Li et al., 2012). Interestingly, such clusters robustly trigger Arp2/3-mediated actin assembly (Banjade and Rosen, 2014). However, how N-WASP and WIP become highly concentrated locally to trigger actin assembly in cells is not well understood. In budding yeast, all known NPFs and over 50 other proteins are organized into plasma membrane-associated patches, which are clathrin-mediated endocytosis (CME) sites (Kaksonen et al., 2005). Extensive efforts have been made to determine the functions of these NPFs and to identify their interacting partners both in vitro and in vivo (Boettner et al., 2011; Goode et al., 2015). In addition, a very detailed pathway has been elucidated in which each endocytic protein is recruited to endocytic sites in a predictable order and with predictable timing (Figure 1A)(Lu et al., 2016). The two most important NPFs, yeast WASP (Las17) and type I myosin (Myo3 and Myo5), which form a complex with yeast WIP (Vrp1) and additional binding partners, can be grouped into a WASP-Myosin module (Kaksonen et al., 2005). The WASP-Myosin module stimulates actin filament assembly and provides motor activity, facilitating membrane invagination and vesicle scission (Galletta et al., 2008; Lewellyn et al., 2015; Sirotkin et al., 2005; Soulard et al., 2002; Sun et al., 2006). Individual components of the WASP-Myosin module are recruited to endocytic sites in a regular, timely order, in which Las17 appears first, followed by Vrp1, and finally Myo3/5, coinciding with the onset of robust actin filament assembly (Sun et al., 2006). Two Sla1 SH3 domains and a Pan1 PRD domain share a crucial role for cell growth. (A) Spatial-temporal recruitment of endocytic proteins. Endocytic proteins are grouped into several modules (Lu et al., 2016) as indicated. Pan1 and End3 appear after the mid coat module proteins but slightly before Sla1 and Las17 appear (Sun et al., 2015). * Note that proteins of the WASP-Myosin module arrive at endocytic sites with different timing. Las17 arrives with a similar timing to Sla1, while the remaining components of the WASP-Myosin module arrive later (Sun et al., 2006). (B) Synthetic genetic interaction between sla1W41AW108A and pan1∆PRD. Cell growth of indicated yeast strains was compared by spotting serial dilutions of liquid cultures on plates at 25°C, or 30°C or 37°C. (C-E) Analysis of sla1W41A-W108A-GFP dynamics. (F-H) Analysis of pan1∆PRD-GFP dynamics. C and F, Maximum fluorescence intensity of GFP-tagged patch proteins at endocytic sites (also see Figure 1—figure supplement 1D and E). (D and G) Lifetime (mean ± SD) of GFP-tagged proteins. E and H, Radial kymograph representations (for explanation, please see Figure 1—figure supplement 2) of GFP-tagged proteins. The scale bars are 20 s.
Recent studies revealed a condition in which WASP-Myosin module driven-actin assembly is uncoupled from cortical endocytic sites in live cells (Bradford et al., 2015; Sun et al., 2015). Multivalent linker proteins Pan1 and End3 appear to associate with each other constitutively (Boeke et al., 2014; Sun et al., 2015), and together with Sla1 (another multivalent linker protein that is recruited to endocytic sites by Pan1 and End3), likely provide equivalent functions to mammalian intersectins (ITSNs) (Goode et al., 2015). When Pan1 and End3 are eliminated from cells by an auxin-based degron method, endocytic sites still assemble at the cell cortex, but WASP-Myosin proteins associate with actin comet tails in the cytoplasm instead of with the endocytic sites (Sun et al., 2015). These findings indicate that the Pan1-End3-Sla1 complex plays essential roles in coupling actin assembly to endocytic sites. However, the Pan1-End3-Sla1 complex interacts with numerous additional proteins throughout endocytosis. An important but challenging task is to identify the specific domain(s) and interactions required for linking actin assembly to endocytic sites. In this study, to mechanistically understand how actin polymerization is coupled to endocytic sites, we identified the key interaction(s) required for concentrating the actin assembly machinery at endocytic sites and we further addressed how these interactions trigger a sudden burst of actin assembly. These results not only deepen our understanding of clathrin-mediated endocytosis, but also provide general mechanistic insights into spatiotemporal regulation of actin assembly in vivo. To explore the mechanism by which actin assembly is coupled to endocytic sites at a molecular level, we sought to identify the functional domains within the endocytic linker proteins that are responsible for the process. Previous studies revealed a synthetic lethal interaction between sla1∆ and pan1∆PRD, in which the Pan1 C-terminal PRD (proline-rich domain) is truncated (Barker et al., 2007)(Figure 1—figure supplement 1A). However, the mechanistic basis for this lethality had not been explored. The Pan1 PRD has been shown to interact with yeast type 1 myosin (Myo3 and Myo5) SH3 domain and enhance Myo3/5-Vrp1 NPF activity in vitro (Barker et al., 2007). However, sla1∆ does not display a synthetic lethal interaction with myo5CA∆myo3∆ (Figure 1—figure supplement 1B), in which the type 1 myosin NPF activity is abolished (Sun et al., 2006). Thus, pan1∆PRD does not appear to cause synthetic lethality with sla1∆ by affecting Myo3/5-Vrp1 NPF activity. To gain insights into how Sla1 and Pan1 are related functionally, it was important to identify the Sla1 functions whose loss results in the synthetic lethal interaction with pan1∆PRD. Therefore, we mutated various domains of Sla1 and crossed the mutants to pan1∆PRD. Strikingly, we found that two amino acid substitutions in Sla1 are sufficient to cause a synthetic genetic interaction with pan1∆PRD. sla1W41AW108A pan1∆PRD cells display severe growth defects at 25°C and 30°C, and are inviable at 37°C (Figure 1B). W41 and W108 are the conserved tryptophan residues in two SH3 (SRC homology 3) domains of Sla1 (Figure 1—figure supplement 1A) (Rodal et al., 2003). Point mutation of these sites abolishes the SH3 domain interactions with PRMs (Rodal et al., 2003). However, a point mutation (W391A) on the third SH3 domain of Sla1 did not show a synthetic interaction with pan1∆PRD (Figure 1B). Thus, our results indicate that the first two SH3 domains of Sla1 and the PRD of Pan1 function in parallel to provide a crucial role for cell growth. We next analyzed the sla1W41AW108A and pan1∆PRD mutants separately. Immunoblotting of whole cell extracts showed that sla1W41AW108A-GFP is well expressed (Figure 1—figure supplement 1C). More importantly, sla1W41AW108A-GFP appeared in cortical patches that reached fluorescence intensity levels similar to wild-type Sla1-GFP patches (Figure 1C and Figure 1—figure supplement 1D). However, the sla1W41AW108A-GFP patch lifetimes were substantially longer and more variable compared to Sla1-GFP patches (78.8 ± 31.2 vs 24.1 ± 4.9, p<0.0001) (Figure 1D). Nevertheless, similar to the wild-type cells, sla1W41AW108A-GFP patches moved inward, off the cell cortex, at the end of their lifetime (Figure 1E), indicating that endocytic internalization still takes place in this mutant. Immunoblotting showed that pan1∆PRD-GFP is also expressed at levels similar to the wild-type protein (Figure 1—figure supplement 1C). In addition, cortical pan1∆PRD-GFP patches reached fluorescence intensity levels similar to wild-type Pan1-GFP patches (Figure 1F and Figure 1—figure supplement 1E). Finally, pan1∆PRD-GFP patch lifetimes were slightly shorter than Pan1-GFP lifetimes (23.6 ± 4.2 vs 28.5 ± 5.5, p<0.0001) (Figure 1G), and they were internalized at the end of their lifetime (Figure 1H). The results described above establish that neither a point mutant of two Sla1 SH3 domains nor a PRD truncation mutant of Pan1 affects either protein’s expression or cortical recruitment. Thus, the severe synthetic growth defect of an sla1 W41AW108A pan1∆PRD double mutant is caused by the loss of specific functions rather than by the absence of the mutant proteins at endocytic sites. We next analyzed the sla1 W41AW108A pan1∆PRD double mutant to determine how the Sla1 SH3 domains and the Pan1 PRD function in endocytosis. We examined cortical patch behavior of GFP-tagged Sla1 (or sla1 mutant) and mCherry-tagged Pan1 (or pan1 mutant) in sla1 W41AW108A and/or pan1∆PRD mutants. Previous studies suggested that Sla1 is recruited to endocytic sites by Pan1 and End3 (Sun et al., 2015; Tang et al., 2000). Sla1 (or the sla1 mutant) appears slightly after Pan1 (or the pan1 mutant), and then internalizes in wild-type cells, pan1∆PRD cells, and sla1W41AW108A cells (Figure 2A–D). Consistent with the results in Figure 1D, patch lifetimes in sla1W41AW108A cells are irregular and longer than in wild-type and pan1∆PRD cells (Figure 2D). However, in the double mutants, sla1W41AW108A and pan1∆PRD colocalize as stable patches at the cell cortex (Figure 2E). Most cortical patches (98.1%, 216 cortical patches from 20 cells were examined) stay nonmotile during the entire 3 min movie, suggesting that endocytic internalization does not occur (Figure 2D and E). A Lucifer yellow uptake assay confirmed a severe endocytic defect (Figure 2—figure supplement 2). Moreover, in the double mutant cells, pan1∆PRD colocalizes with Sla2 (Figure 2F), a signature protein for endocytic sites, and the yeast homologue of vertebrate HIP1R (Engqvist-Goldstein et al., 2001). These results indicate that the nonmotile cortical sla1W41AW108A/pan1∆PRD patches are nonproductive endocytic sites. We next sought to determine why the sites were nonproductive. Endocytic internalization is defective in sla1 W41AW108A pan1∆PRD mutant cells. (A-C) Single frames (left) from movies and circumferential kymograph representations (for the explanation, please see Figure 2—figure supplement 1) for GFP- and mCherry-tagged proteins. (A) SLA1-GFP PAN1-mCherry cells. (B) SLA1-GFP pan1∆PRD-mCherry cells. (C) sla1W41AW108A-GFP PAN1-mCherry cells. (D) Lifetime (mean ±SD) and radial kymograph representations of GFP- and mCherry-tagged proteins for indicated strains. (E) Single frame (left) from a 3 min movie and circumferential kymograph representations of sla1W41AW108A-GFP pan1∆PRD-mCherry cells. (F) Single frame (left) from 3 min movie and circumferential kymograph representation of pan1∆PRD-GFP and Sla2-TagRFP-T in sla1W41AW108A cells. The scale bars on kymographs are 20 s. The scale bars on cell pictures are 2 µm. 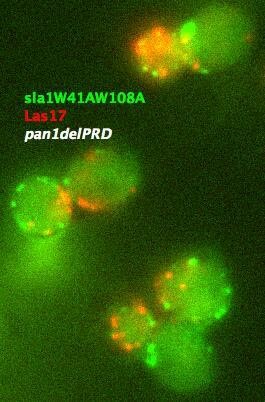 Previous in vitro studies showed that Sla1 interacts with the yeast WASP Las17 through SH3-PRM interactions (Feliciano and Di Pietro, 2012; Rodal et al., 2003). We therefore examined where Las17 is located relative to the nonproductive endocytic sites in sla1 W41AW108A and pan1∆PRD single and double mutants. In wild-type cells, Sla1 and Las17 accumulate and then leave endocytic sites with similar kinetics (Figure 3A). In sla1W41AW108A cells, Las17 still colocalizes with sla1W41AW108A patches (Figure 3B). However, Las17-GFP reaches its maximum fluorescence intensity approximately 20 s after sla1W41AW108A. More importantly, Las17-GFP fluorescence intensity reaches only half of its maximum value and continues to increase when sla1W41AW108A-mCherry fluorescence intensity has already begun to decline. Thus, in sla1W41AW108A cells, cortical recruitment of Las17 is no longer synchronized with sla1W41AW108A recruitment. These results are consistent with a role for Sla1 in Las17 recruitment (Feliciano and Di Pietro, 2012). However, Las17 is still recruited to endocytic sites in sla1W41AW108A cells, indicating that additional proteins help to recruit Las17. In pan1∆PRD cells, Las17-GFP reaches its maximum fluorescence intensity about 5 s after Sla1-mCherry (Figure 3C). Thus, Las17 recruitment is also defective in pan1∆PRD cells, although to a lesser extent than in sla1W41AW108A cells. Las17 (yeast WASP) is not recruited to cortical endocytic sites in sla1W41AW108A pan1∆PRD mutant cells. (A-C) Single frames (top) from movies and circumferential kymograph representations (middle) of GFP- and mCherry-tagged proteins. Averaged (mean ±SD) fluorescent intensity profiles for GFP- and mCherry-tagged proteins from 10 individual patches (bottom). (A) SLA1-mCherry LAS17-GFP cells. (B) sla1W41AW108A-mCherry LAS17-GFP cells. Note that the fluorescence intensity profile for this strain was only analyzed for the last 50 s of the patch lifetime. (C) SLA1-mCherry LAS17-GFP pan1∆PRD cells. (D and E) A single frame and maximum intensity projection of all frames from a movie (Video 1) of sla1W41AW108A-GFP LAS17-TagRFP-T pan1∆PRD cells. (E) Enlarged views of the boxed-areas shown in D. The arrows indicate Las17 patches in cytoplasm. (F) Circumferential kymograph representation of sla1W41AW108A-GFP and Las17-TagRFP-T in pan1∆PRDcells. The arrow indicates that a Las17-TagRFP-T patch transiently colocalizes with a static sla1W41AW108A-GFP patch. The scale bars on kymographs are 20 s. The scale bars on cell pictures are 2 µm. In sla1W41AW108A pan1∆PRD cells, cortical sla1W41AW108A patches stay non-motile at the cell cortex, while Las17 patches move dynamically along the cell cortex and throughout the cytoplasm (Figure 3D–F and Video 1). Most cortical sla1W41AW108A patches did not recruit any detectable Las17 during a 2 min movie (95.4%, 131 patches from 14 cells were examined) (Figure 3F). In rare cases (4.6%), Las17 patches appeared to transiently colocalize with cortical sla1W41AW108A patches (Figure 3F). However, unlike in wild-type cells, neither sla1W41AW108A patches nor Las17 patches disassemble after the transient colocalization (Figure 3F). A likely explanation for such transient colocalization is that Las17 patches move along the cortex and move to or near the non-motile sla1W41AW108A patches by chance. Thus, in sla1W41AW108A pan1∆PRD cells, Las17 is no longer recruited to cortical endocytic sites. Dynamics of sla1W41AW108A-GFP and Las17-TagRFP-T in sla1W41AW108A-GFP LAS17-TagRFP-T pan1∆PRD cells. Time to acquire one image pair is 1.8 s. Interval between frames is 1.8 s.
Since Las17 is not recruited to cortical endocytic sites in sla1W41AW108A pan1∆PRD cells, we asked how actin dynamics are affected. Fluorescently tagged-Abp1 (Actin binding protein 1) and Sac6 (yeast fimbrin), which both localize to cortical actin patches, were used to monitor endocytic actin assembly in the following experiments. These actin markers were used interchangeably because neither detectably altered actin function or dynamics. In wild-type, pan1∆PRD, or sla1W41AW108A cells, the cortical actin patch marker Abp1(Actin binding protein 1) appears at endocytic sites at the end of the Sla1 (or sla1 mutant) lifetime, and both proteins are internalized and disappear (Figures 4A, B and C). Strikingly, instead of forming cortical patches in sla1 W41AW108A pan1∆PRD cells, actin formed comet tails, as seen with Abp1-RFP (Figure 4D) or Sac6-GFP (Figure 4E). Multifocus microscopy (MFM) (Abrahamsson et al., 2013) clearly demonstrated that these actin comet tails slide along the cell cortex or move through the cytoplasm over time (Figure 4E, Video 2). More importantly, these actin comet tails do not appear to originate at or associate stably with the cortical static sla1W41AW108A patches in sla1 W41AW108A pan1∆PRD cells (Figure 4D, Video 3). We examined 304 cortical static sla1W41AW108A patches in 30 sla1W41AW108A pan1∆PRD cells and found that only 32 (10.5%) of them transiently colocalized with actin comet-tails during a 3 min movie (Figure 4D). However, unlike in wild-type cells, the sla1W41AW108A-GFP patches remained stationary at the cell cortex after these rare, transient colocalizations (Figure 4D). Thus, actin comet tails may move to or near the nonmotile sla1W41AW108A/pan1∆PRD patches by chance when the comet tails move along the cell cortex. Dynamics of Sac6-GFP in sla1W41AW108A pan1∆PRD cells captured by multifocus microscopy (MFM). Time interval between frames is 250 ms.
Dynamics of sla1W41AW108A-GFP and Abp1-RFP in sla1W41AW108A-GFP ABP1-RFP pan1∆PRD cells. WASP-Myosin module proteins localize at the leading tip of actin comet tails in sla1W41AW108A pan1∆PRD mutant cells. (A-C) Single frames (left) from movies and circumferential kymograph presentations (right) of GFP- and RFP-tagged proteins. (A) SLA1-GFP ABP1-RFP cells. 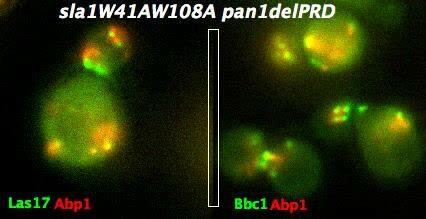 (B) SLA1-GFP ABP1-RFP pan1∆PRD cells. 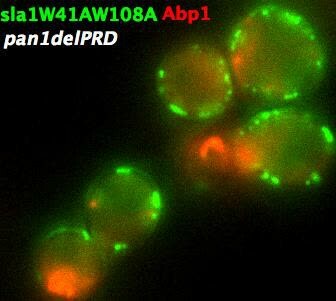 (C) sla1W41AW108A-GFP ABP1-RFP cells. (D) Single frame (top left) from movie (Video 3) and circumferential kymograph representations (top right) of sla1W41AW108A-GFP and Abp1-RFP in pan1∆PRD cells. Montages of individual actin comet tails in the boxed areas in the top left image (bottom). (E) Dynamics of Sac6-GFP in sla1W41AW108A pan1∆PRD cells observed by multifocus microscopy (MFM). An example of three simultaneously acquired Z-planes that are artificially colored in green, red or blue (bottom panel). Note that the actin tails in the merged image reveal different colors depending on their positions in Z-planes. Montage of one actin comet tail from a movie (Video 2) acquired in multiple Z-planes simultaneously at 1 frame/250 msec (top right). Note that the actin tail changes colors over time, reflecting movement through the cytoplasm. (F) Single frames from movies (Videos 4 and 5) of cells expressing indicated GFP-tagged protein and Abp1-RFP. The arrows indicate that WASP-Myosin module proteins localize at the leading tip of actin comet tails in sla1W41AW108A pan1∆PRD mutants. The scale bars for kymographs are 20 s. The scale bars for cell pictures are 2 µm. As we showed above, Las17 patches and actin comet-tails are not associated with the nonproductive cortical endocytic sites in sla1W41AW108A pan1∆PRD cells. We next determined the spatial relationship between Las17 and actin comet tails in this mutant. Interestingly, in the sla1W41AW108A pan1∆PRD mutant, Las17 patches localized at the leading tips of actin comet tails and are apparently propelled by actin assembly in a manner similar to actin rocket tails on pathogens such as vaccinia virus or Shigella flexneri (Welch and Way, 2013) (Figure 4F, Video 4). Similar to Las17, several other components of WASP-Myosin module, including Vrp1, Myo5, and Bbc1, were also observed at the leading tip of actin comet tails in sla1W41AW108A pan1∆PRD cells (Figure 4F, Video 4, and Video 5). These results show that the actin comet tails share molecular characteristics with the endocytic actin machinery. Thus, the endocytic actin machinery no longer assembles at cortical endocytic sites in sla1W41AW108A pan1∆PRD cells, but at distinct sites, the nature of which is presently obscure. Consistently, the yeast Eps15, Ede1, which is one of the early module proteins (Figure 1A) and functions in endocytic site initiation and stabilization (Kaksonen et al., 2005), is not detected at the tip of the actin comet tails (Figure 4—figure supplement 1). These results demonstrate that the WASP-Myosin module proteins can induce actin assembly and forces independent of the upstream endocytic machinery. 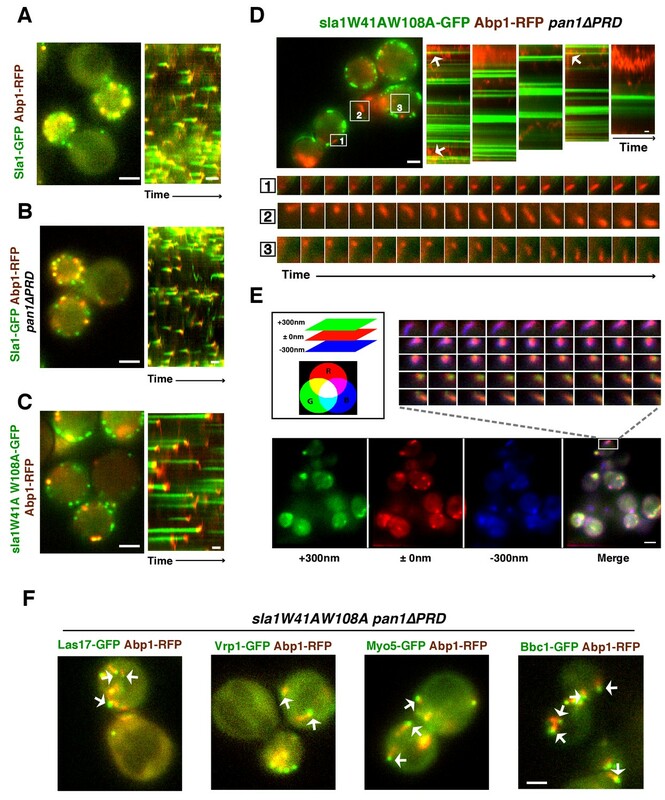 Dynamics of Las17-GFP or Bbc1-GFP and Abp1-RFP in sla1W41AW108A pan1∆PRD cells. Dynamics of Vrp1-GFP or Myo5-GFP and Abp1-RFP in sla1W41AW108A pan1∆PRD cells. Together, our results indicate that two Sla1 SH3 domains and the Pan1 PRD together play indispensable roles in coupling the WASP-Myosin machinery to endocytic sites. Thus, we conclude that WASP-Myosin module proteins are recruited to endocytic sites mainly through SH3-PRM interactions (Sla1 recruits PRD-containing proteins and Pan1 recruits SH3 domain-containing proteins). Previous in vitro results suggested that Sla1 SH3 domains inhibit Las17 NPF activity (Feliciano and Di Pietro, 2012; Rodal et al., 2003), while the Pan1 PRD activates Myo3/5 NPF activity (Barker et al., 2007). Next, we addressed the recruitment and NPF regulatory roles of the Sla1 SH3 domains and the Pan1 PRD in WASP-Myosin module regulation. The sla1W41AW108A pan1∆PRD mutant provides a unique opportunity to identify the key player(s) that recruit the actin assembly machinery to endocytic sites and to explore which parameters are important for triggering actin assembly. Thus, we developed a strategy to artificially direct selected proteins to cortical sla1W41AW108A/pan1∆PRD sites, and then tested whether cell growth and productive endocytic actin assembly were restored. Previous studies reported that End3’s C-terminus (end3C) interacts with the Pan1 central region with high affinity (Kd = 27 nM)(Boeke et al., 2014; Sun et al., 2015). This C-terminal region contains less than 200 amino acids (Figure 1—figure supplement 1A) and its primary function is to mediate cortical recruitment through interaction with the Pan1 N-terminus (Sun et al., 2015; Tang et al., 2000). These features make end3C an appealing candidate to recruit Las17 to pan1∆PRD sites in sla1W41AW108A pan1∆PRD double mutants. We generated a LAS17-end3C strain and tagged Las17-end3C with GFP. The sequence encoding Las17-end3C-GFP was integrated into the LAS17 chromosomal locus so the hybrid gene was expressed from LAS17’s endogenous promoter. las17WCA∆ myo5CA∆ myo3∆ cells exhibit severe growth defects due to the loss of NPF activity from both NPFs (Sun et al., 2006). However, LAS17-end3C-GFP myo5CA∆ myo3∆ cells grow well (Figure 5—figure supplement 1A). We conclude that the end3C fusion does not interfere Las17’s NPF activity. Strikingly, Las17-end3C-GFP restored sla1W41AW108A pan1∆PRD cells to normal growth at not only 25°C and 30°C, but also the non-permissive temperature of 37°C (Figure 5A). Remarkably, Las17-end3C-GFP even rescued sla1∆ pan1∆PRD from lethality at all temperatures (Figure 5A and Figure 5—figure supplement 1B). Las17-end3C-GFP in LAS17-end3C-GFP sla1W41AW108A pan1∆PRD cells is expressed at levels indistinguishable from Las17-GFP in wild-type cells (Figure 5—figure supplement 1C). 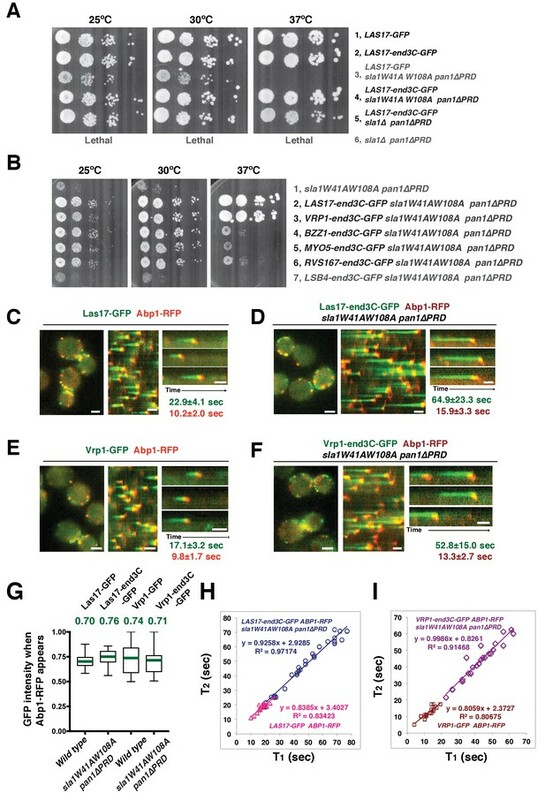 Furthermore, there is no significant difference in patch maximum fluorescence intensity between Las17-end3C-GFP in the LAS17-end3C-GFP sla1W41AW108A pan1∆PRD mutant and Las17-GFP in wild-type cells (Figure 5—figure supplement 1D and E). In addition, Las17-end3C-GFP patches only appear at the cell cortex and they develop fluorescence intensity with similar kinetics to pan1∆PRD-mCherry in the sla1W41AW108A pan1∆PRD mutant (Figure 5—figure supplement 1F), indicating that end3C is sufficient to recruit Las17 to cortical endocytic sites through its interaction with pan1∆PRD when the Sla1 SH3- and Pan1 PRD- mediated interactions are absent. We conclude that artificial Las17 recruitment bypasses the requirement for the Sla1 SH3 domains and Pan1 PRD for normal cell growth. A WASP-end3C chimeric protein or a WIP-end3C chimeric protein restores normal growth and productive endocytic actin assembly in an sla1W41AW108A pan1∆PRD mutant. The onset of actin assembly is tightly coupled to accumulation of a threshold of WASP or WIP at endocytic sites. (A and B) Cell growth at 25°C, 30°C or 37°C of indicated yeast strains spotted as serial dilutions of liquid cultures on plates (also see Figure 5—figure supplement 1B). (C and E) Single frame (left) from movie (Video 6 or Video 7), circumferential kymograph representation (middle), and radial kymograph representations (right) of Las17-GFP and Abp1-RFP, or Vrp1-GFP and Abp1-RFP in wild-type cells. (D and F) Single frame (left) from movie (Video 6 and Video 7), circumferential kymograph presentation (middle), and radial kymograph representation (right) of Las17-end3C-GFP and Abp1-RFP, or Vrp1-end3C-GFP and Abp1-RFP in sla1W41AW108A pan1∆PRD cells. The numbers shown in C-F are lifetime of GFP-tagged protein (in green) and Abp1-RFP (in red) in the indicated strains (also see Figure 5—figure supplement 3A). (G) The average fluorescence intensity of GFP-tagged patch proteins at the moment when the Abp1-RFP signal appear at endocytic sites for the indicated strains. H and I, T1vs T2 plots for indicated strains (for the details, please see Figure 5—figure supplement 3B). The scale bars in kymographs are 20 s. The scale bars on cell pictures are 2 µm. We next fused end3C to the C-terminus of additional SH3 domain- or PRD-containing endocytic proteins (Figure 5—figure supplement 2) and determined whether they could also restore normal growth to sla1W41AW108A pan1∆PRD cells (Figure 5B). Intriguingly, Vrp1-end3C fully restored cell growth, similar to Las17-end3C. Bzz1-end3C (yeast functional homolog of TOCA-1, FBP17, CIP4, or PACSIN) and Rvs167-end3C (yeast Amphiphysin) also rescued cell growth, but to lesser extents, particularly at 37°C. In addition, Myo5-end3C rescued sla1W41AW108A pan1∆PRD cell growth, but to a lesser extent than Bzz1-end3C or Rvs167-end3C. In contrast, Lsb4-end3C (yeast SH3YL1a) (Figure 5B) and Bbc1-end3C (data not shown) did not rescue cell growth. Thus, we have identified five PRD- or SH3 domain- containing endocytic proteins that can rescue cell growth of the sla1W41AW108A pan1∆PRD mutant to different extents when they are fused to end3C. 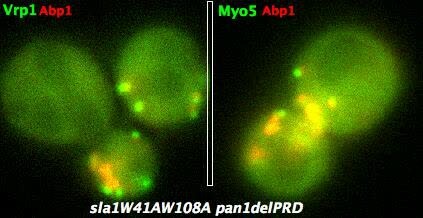 Since end3C fused to Las17 (yeast N-WASP) or Vrp1 (yeast WIP) restored sla1W41AW108A pan1∆PRD to normal growth (Figure 5A and B), we examined endocytic actin assembly in these two strains. As in wild-type cells (Figure 5C and E), Abp1-RFP labeled cortical actin patches moved inward and then disappeared in both LAS17-end3C-GFP sla1W41AW108A pan1∆PRD (Figure 5D) (Video 6) and VRP1-end3C-GFP sla1W41AW108A pan1∆PRD cells (Figure 5F) (Video 7), indicating that the actin assembly is productive and that endocytic internalization is restored in the mutant strains. Consistently, cytoplasmic actin comet tails were no longer observed in these two mutants (Figure 5D and F, Videos 6 and 7). The patch lifetimes of Las17-end3C-GFP or Vrp1-end3C-GFP in sla1W41AW108A pan1∆PRD cells, respectively, were less regular and approximately two times longer than the lifetimes of Las17 or Vrp1 in wild-type cells (Figure 5C–F and Figure 5—figure supplement 3A). In contrast, the actin patch (Abp1-RFP) lifetimes were much less affected in LAS17-end3C-GFP sla1W41AW108A pan1∆PRD or VRP1-end3C-GFP sla1W41AW108A pan1∆PRD cells compared to wild-type cells. These results demonstrate that restoring Las17 or Vrp1 cortical localization using artificial, engineered fusions, is sufficient to direct productive actin assembly to cortical endocytic sites to compensate for loss of interactions mediated by Sla1 SH3 domains and the Pan1 PRD. Thus, our data indicate that Sla1 SH3 domains and the Pan1 PRD primarily function in recruitment, rather than the NPF regulation, of the WASP-Myosin module. , Dynamics of Las17-GFP and Abp1-RFP in wild type cells and dynamics of Las17-end3C-GFP and Abp1-RFP in sla1W41AW108A pan1∆PRD cells. Time to acquire one image pair is 1.1 s. Interval between frames is 1.1 s.
, Dynamics of Vrp1-GFP and Abp1-RFP in wild-type cells and dynamics of Vrp1-end3C-GFP and Abp1-RFP in sla1W41AW108A pan1∆PRD cells. Time to acquire one image pair is 1.2 s. Interval between frames is 1.2 s.
Previous studies suggest that in contrast to its mammalian N-WASP homologue, Las17’s actin nucleation promoting activity is not autoinhibited in vitro (Feliciano and Di Pietro, 2012; Rodal et al., 2003). However, actin assembly is only observed approximately 15 s after Las17 is recruited to endocytic sites in wild-type cells (Figure 5C). The interaction between the first two Sla1 SH3 domains and the Las17 PRD is thought to be important for keeping Las17 inactive until actin assembly starts (Feliciano and Di Pietro, 2012; Rodal et al., 2003). In sla1W41AW108A pan1∆PRD cells, the Las17-end3C nucleation promoting activity can no longer be inhibited by sla1W41AW108A due to the lack of functional Sla1 SH3 domains, so actin assembly might occur prematurely. 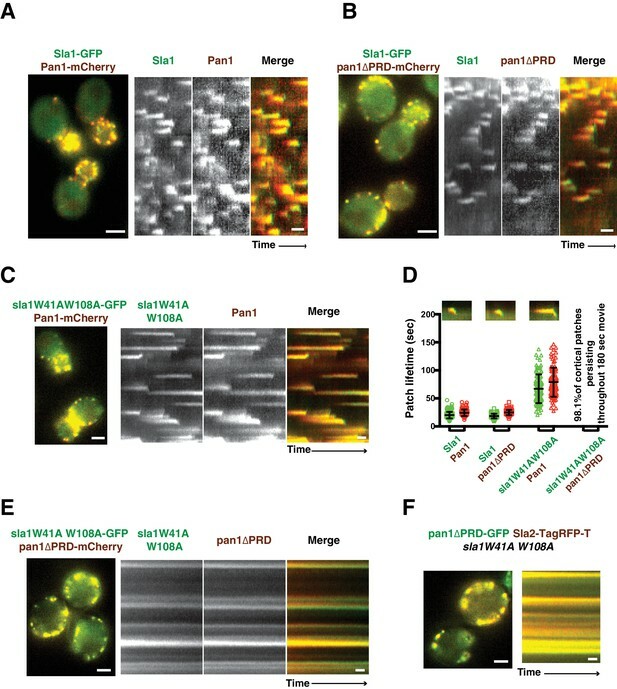 However, in the sla1W41AW108A pan1∆PRD mutant, Las17-end3C-GFP persisted at endocytic sites even longer than in wild-type cells before actin assembly was initiated (Figure 5D). These results indicate that Las17 NPF activity at endocytic sites does not appear to be regulated as was previously assumed. We next investigated which parameters are important for the onset of actin assembly. We asked whether the quantity of Las17 or Vrp1 at endocytic sites predicts endocytic actin assembly initiation. The fluorescence intensity of the GFP-tagged proteins at the moment when the Abp1-RFP signal appeared (the onset of actin assembly) at endocytic sites was determined for the strains shown in Figure 5C–F. 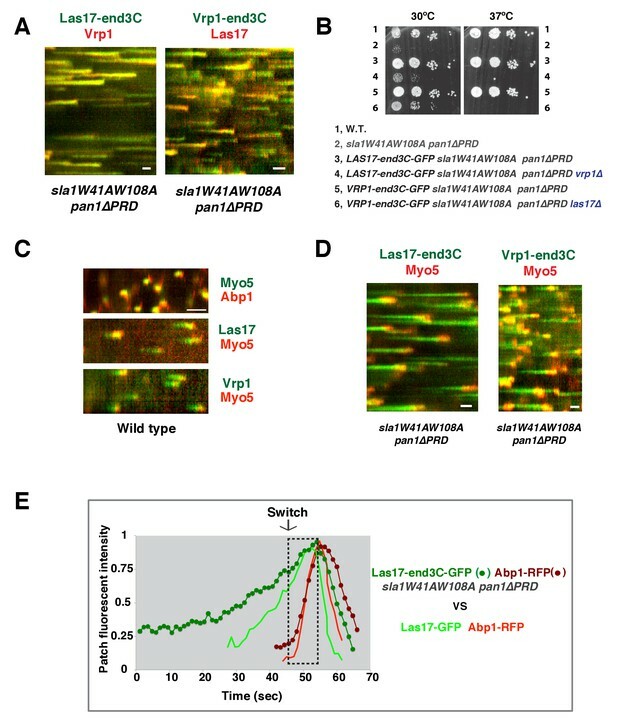 Interestingly, regardless of differences in lifetimes, the average intensities of the GFP-tagged Las17 and Vrp1 were all in a similar range (70–80% of their maximum intensity) when actin assembly was initiated (Figure 5G and Figure 5—figure supplement 3B). Importantly, the end3C-fusions did not alter expression levels of the tagged proteins (Figure 5—figure supplement 1C and Figure 5—figure supplement 2A). Thus, these results establish that productive actin assembly is initiated when similar numbers of Las17 and Vrp1 are recruited to endocytic sites in wild-type and LAS17-end3C-GFP sla1W41AW108A pan1∆PRD cells. Furthermore, when the time, T1, during at which the GFP-tagged protein reaches its average intensity, was plotted against the time T2, when actin assembly is first detected, for numerous individual endocytic events in these strains (Figure 5H–I, Figure 5—figure supplement 3B), the high R-squared values of the linear trendlines drawn for these plots indicated that a threshold accumulation (70–80% of their maximum quantity at endocytic sites) of Las17 or Vrp1 at endocytic sites is tightly correlated with the onset of productive actin assembly in both wild-type and in sla1W41AW108A pan1∆PRD cells. When Las17-end3C or Vrp1-end3C is recruited to endocytic sites through interaction of its end3C domain with pan1∆PRD, other proteins associated with the cytoplasmic actin comet tails observed in sla1W41AW108A pan1∆PRD cells presumably reach cortical endocytic sites by (direct or indirect) interactions with the end3C-fused protein. We next quantitatively addressed how Las17-end3C or Vrp1-end3C recruit their binding partners to endocytic sites and facilitate productive actin assembly in sla1W41AW108A pan1∆PRD cells. In sla1W41AW108A pan1∆PRD cells, Las17-end3C-GFP and Vrp1-mCherry, or Vrp1-end3C-GFP and Las17-TagRFP-T, respectively, developed fluorescence intensity with identical kinetics at cortical patches (Figure 6A and Figure 6—figure supplement 1A and B). Thus, when cortical localization of either Las17 or Vrp1 is restored through an end3C fusion in sla1W41AW108A pan1∆PRD cells, the other protein is recruited simultaneously. This result explains why Las17-end3C and Vrp1-end3C rescue the sla1W41AW108A pan1∆PRD mutant phenotypes to the same extent (Figure 5B). Moreover, our genetic studies indicated that Vrp1 or Las17 is required for Las17-end3C or Vrp1-end3C, respectively, to restore normal growth of sla1W41AW108A pan1∆PRD cells (Figure 6B). On the other hand, similar to the wild-type cells (Figure 5C and E, Figure 6C), the onset of actin assembly appears to coincide with the recruitment of Myo5-GFP (type I Myosin) in LAS17-end3C-GFP sla1W41AW108A pan1∆PRD cells (Figure 5D and Figure 6D) and in VRP1-end3C-GFP sla1W41AW108A pan1∆PRD cells (Figure 5F and Figure 6D). Taken together, Las17 and Vrp1 (recruited by end3C fusions) are necessary and sufficient to recruit the WASP-Myosin module proteins to endocytic sites and restore productive endocytic actin assembly, compensating for loss of interactions mediated by multivalent endocytic linker proteins. Actin assembly is triggered in a switch-like manner that corresponds to a threshold level of WASP-WIP accumulation. (A) Circumferential kymograph presentations of GFP- and mCherry- or TagRFP-T-tagged proteins for indicated yeast strains (also see Figure 6—figure supplement 1). (B) Examining growth of indicated yeast strains by spotting serial dilutions of liquid cultures on plate. (C) Circumferential kymograph presentations of GFP- and RFP- or TagRFP-T-tagged proteins in wild-type cells. (D) Circumferential kymograph presentations of GFP- and TagRFP-T-tagged proteins for indicated yeast strains. (E) Alignment of averaged intensity measurements of GFP- and RFP-tagged proteins from the indicated yeast cells. For more details, please also see Figure 6—figure supplement 2. The scale bars in kymographs are 20 s.
To further assess the onset of actin assembly kinetically, we analyzed fluorescence intensity development of GFP- and RFP-tagged proteins in LAS17-end3C-GFP ABP1-RFP sla1W41AW108A pan1∆PRD and LAS17-GFP ABP1-RFP cells (Figure 5C and D). As shown in Figure 6E and Figure 6—figure supplement 2, Abp1-RFP joins Las17-GFP or Las17-end3C-GFP patches when the GFP-tagged proteins reach 70–80% of maximum intensity in LAS17-GFP ABP1-RFP or LAS17-end3C-GFP ABP1-RFP sla1W41AW108A pan1∆PRD cells. It takes much longer for Las17-end3C-GFP to reach 70–80% of its maximum intensity in sla1W41AW108A pan1∆PRD cells than for Las17-GFP to reach those levels in wild-type cells. This delay reflects the much longer lifetime of Las17-end3C-GFP patches observed in sla1W41AW108A pan1∆PRD cells (Figure 5C and D, Figure 5—figure supplement 3A). Thus, even though Las17 NPF activity cannot be inhibited by sla1W41AW108A, Las17-end3C-GFP does not appear to initiate actin nucleation until it reaches a ‘threshold’ of 70–80% of its maximum intensity. Intriguingly, once Las17-GFP or Las17-end3C-GFP reaches an apparent ‘threshold’ level, the Abp1-RFP signal increases rapidly and reaches its maximum level at a similar rate in both wild-type and LAS17-end3C-GFP sla1W41AW108A pan1∆PRD cells (Figure 6E). Thus, productive endocytic actin assembly appears to be triggered in an ‘all or nothing’ manner once the quantity of Las17 (as well as Vrp1, based on Figure 6—figure supplement 1A) reaches a threshold level, regardless how recruitment occurs. Previous studies indicated that Las17 and the Myo3/5 (type I myosin)-Vrp1 complex are the two major NPFs for endocytic actin assembly (Sirotkin et al., 2005; Sun et al., 2006). Vrp1 is required for Myo3/5’s recruitment and NPF activation. As we showed above, Myo3/5 arrives at endocytic sites with similar timing to the onset of actin assembly in both wild-type and sla1W41AW108A pan1∆PRD mutant cells (Figure 5C–F, Figure 6C and D). Thus, similar to actin assembly, Myo3/5 recruitment also appears to occur in a switch-like manner upon Vrp1 accumulation to a threshold level. To further explore this mechanism, we next examined how type I myosin recruitment affects the onset endocytic actin assembly. To do this, we altered the mechanism for type I myosin recruitment to endocytic sites by fusing end3C to Myo5 in myo3∆ strain. MYO5-end3C las17WCA∆ myo3∆ cells grow much better than myo5CA∆ las17WCA∆ myo3∆ cells, suggesting that NPF activity is retained in Myo5-end3C fusion protein (Figure 5—figure supplement 2D). As expected, Myo5-end3C-GFP was now recruited (through an end3C-Pan1 interaction) to endocytic sites much earlier than in wild-type cells relative to other proteins such as Las17 (Figure 6C and Figure 7A), and it had a longer lifetime (Figure 7B). The timing of recruitment and lifetime of Myo5-end3C-GFP are similar to those of Las17 and Vrp1 (Figure 7A and B)(Sun et al., 2006). However, actin assembly was not triggered during the first 12.6 ± 4.9 s of Myo5-end3C-GFP lifetime (Figure 7A–C, Video 8), even though Myo5-end3C and Vrp1 (as well as Las17) were both present at cortical patches (Figure 7A). Thus, the co-existence of type I Myosin and Vrp1 at endocytic sites is not sufficient to trigger actin assembly. Strikingly, in these mutant cells in which type I myosin arrives at endocytic sites with altered timing, the onset of actin assembly still coincided with the same apparent threshold level of Vrp1 recruitment (Figure 7D and Figure 7—figure supplement 1). These results suggest that NPF activation of type I myosin by Vrp1 also occurs in an ‘all or nothing’ manner. 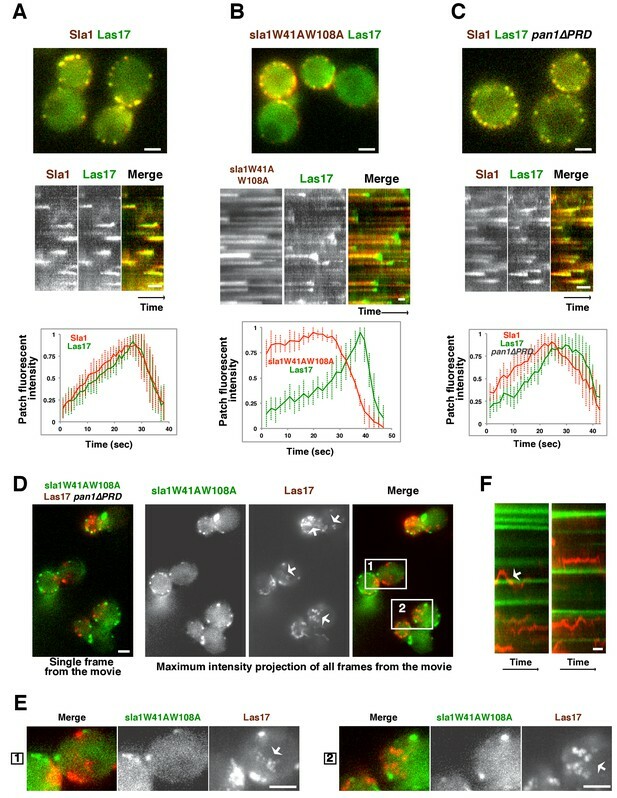 More importantly, these data further support a model in which recruitment of a threshold level of Las17 and Vrp1 plays a decisive role in switch-like initiation of productive actin assembly in vivo. The onset of actin assembly coincides with WIP recruitment to a threshold level in cells expressing Myo5-end3C-GFP. (A) Circumferential kymograph presentations of GFP- and RFP- or TagRFP-T-tagged proteins in the indicated yeast strains. The MYO3 gene was knocked out in all strains. (B) Lifetimes of GFP- and RFP-tagged proteins in the indicated strains. (C) Time difference between the arrival of GFP- and RFP tagged proteins in the indicated strains. (D) Alignment of averaged intensity profiles of GFP- and mCherry or RFP-tagged proteins in the indicated yeast cells. For more details, please also see Figure 7—figure supplement 1. The scale bars in kymographs are 20 s.
Dynamics of Myo5-GFP and Abp1-RFP in wild-type cells and dynamics of Myo5-end3C-GFP and Abp1-RFP in myo3∆ cells. Time to acquire one image pair is 1.0 s. Interval between frames is 1.0 s.
A core actin force-generating machine consisting of the Arp2/3 complex, NPFs and type 1 myosin generates forces on membranes for a wide variety of biological processes, from yeast to humans (Cheng et al., 2012; Gupta et al., 2013; Kim and Flavell, 2008; Krendel et al., 2007; Lewellyn et al., 2015; McIntosh and Ostap, 2016; Sirotkin et al., 2005; Sun et al., 2006). How this machine is recruited to a specific membrane domain and the principles governing actin assembly and force generation are still not well understood in vivo due to factors including the complexity of the network of protein-protein interactions involved (Johnson and Hummer, 2013; Takenawa and Suetsugu, 2007) and the apparent functional redundancy (Galletta et al., 2008; Lewellyn et al., 2015; Sirotkin et al., 2005; Sun et al., 2006). Here, we used genetics and live-cell imaging to investigate the molecular principles governing the recruitment and activation of this actin assembly and force-generating machine in vivo. The yeast WASP Las17 PRD and the type I myosin Myo3/5 SH3 domain have previously been shown to interact with Sla1’s SH3 domains and with Pan1’s PRD in vitro, respectively, to regulate Las17 and Myo3/5-Vrp1 NPF activity (Barker et al., 2007; Feliciano and Di Pietro, 2012; Rodal et al., 2003). However, the results from the current study strongly indicate that the crucial in vivo function of two Sla1 SH3 domains and the Pan1 PRD is instead to recruit components of the WASP-Myosin module through formation of a robust interaction network (discussed further in the following sections), triggering actin assembly and orchestrating force production at endocytic sites. We propose that the Sla1 SH3 domains play a primary role in guiding WASP-Myosin module proteins to endocytic sites by interacting with Las17 (which in turn interacts with Vrp1), while the Pan1 PRD plays a supportive role (Figure 8A). In mutant cells in which either the two Sla1 SH3 domains are mutated (Figure 3B) or the Las17 PRD is partially truncated (Feliciano and Di Pietro, 2012), coordination of cortical Las17 and Sla1 recruitment is disrupted. In these cases, the Pan1 PRD can still interact with Myo3/5 (Barker et al., 2007), which interacts with Vrp1 and Las17 (Evangelista et al., 2000), to organize the actin machinery at endocytic sites (Figure 8A). It is also possible that the Pan1 PRD interacts with other SH3 domain-containing proteins, which interact with Las17. When both the Sla1 SH3 domains and the Pan1 PRD are mutated, the WASP-Myosin module components fail to be recruited to endocytic sites (Figure 8B). Future studies should explore whether the Pan1 PRD and/or Vrp1 PRD interact with other SH3 domain-containing endocytic proteins besides Myo3/5 (Figure 8A). Models for roles of SH3 domain-PRM interactions in spatiotemporal regulation of actin assembly in wild-type cells (A), in sla1W41AW108A pan1∆PRD cells (B), in sla1W41AW108A pan1∆PRD LAS17-end3C-GFP or sla1W41AW108A pan1∆PRD VRP1-end3C-GFP cells (C). Blue represents PRD containing proteins. Yellow represents SH3 domain-containing proteins. The gray two-way arrows indicate SH3 domain-PRM interactions previously demonstrated by in vitro assays. The dotted line with a question mark indicates possible SH3 domain-PRM interactions. The purple arrows indicate non-SH3 domain-PRM interactions that have previously been identified. The green arrow indicates the interaction between end3C and pan1∆PRD. The grey half circle indicates that multiple proteins function as a complex. The switch symbol marks the onset of actin assembly. See Discussion for description. In our model, Pan1 and End3 recruit Sla1 (Sun et al., 2015), and the Pan1-End3-Sla1 complex guides endocytic actin assembly to endocytic sites through an SH3-PRM interaction network. The metazoan counterpart of Pan1-End3-Sla1 is likely intersectin (ITSN), which has both EH domains and SH3 domains in a single protein (Tsyba et al., 2011). ITSN was reported to interact with N-WASP and to regulate actin assembly (Hussain et al., 2001; McGavin et al., 2001). Furthermore, recent studies suggest that the vaccinia virus protein A36 recruits ITSN1 to the virus prior to its actin-based motility, and that ITSN1 promotes N-WASP-dependent actin polymerization (Donnelly et al., 2013; Humphries et al., 2014; Snetkov et al., 2016). Thus, the Pan1-End3-Sla1 function revealed here may reflect a general role of ITSN in spatiotemporally regulating N-WASP-dependent actin polymerization in various cellular processes. Here, we developed a novel ‘end3C fusion’ method to recruit proteins to endocytic sites independent of the Sla1 SH3 domains and the Pan1 PRD. One important feature of this method is that the end3C fusion does not affect the native expression levels of the proteins being tagged. Underproduction or overproduction of Las17 or Vrp1 tends to dramatically influence their cellular functions (Shively et al., 2013), likely complicating interpretations. Using this powerful in vivo system, we were able to demonstrate that Las17 and Vrp1 preferentially interact with each other, and together they are necessary and sufficient to recruit the remaining WASP/Myosin module components to endocytic sites in sla1W41AW108A pan1∆PRD cells. Several lines of evidence support the conclusion that once they are recruited by the multivalent Pan1-End3-Sla1 complex, Las17 and Vrp1 in turn recruit their binding partners to endocytic sites through additional multivalent PRM and SH3-domain interactions, greatly expanding the interaction network. The Las17 PRD (proline-rich domain) contains 20 SH3-binding PRMs (proline-rich motifs) (Feliciano and Di Pietro, 2012). Vrp1 is very rich in proline and also contains more than 20 PRMs (Donnelly et al., 1993). In budding yeast, there are only 25 SH3 domain-containing proteins in total. Remarkably, 11 of them interact with Vrp1 and/or Las17 through PRM-SH3 domain interactions (Anderson et al., 1998; Geli et al., 2000; Rajmohan et al., 2009; Tarassov et al., 2008; Tong et al., 2002; Tonikian et al., 2009; Verschueren et al., 2015). These proteins arrive at endocytic sites with similar timing to, or after, Las17 and Vrp1 (Figure 8A)(Boettner et al., 2011). Some Vrp1- and Las17-binding proteins themselves have multiple SH3 domains, either in their primary sequences or as the result of dimerization or oligomerization. For example, Bzz1 contains two SH3 domains and the hetero-dimeric N-BAR protein (Kishimoto et al., 2011) Rvs161/167 dimerizes through N-BAR domains (Colwill et al., 1999). In addition, in vitro studies have shown that some of these SH3 proteins are able to bind to multiple PRMs of the Las17 PRD (Tong et al., 2002). Multiple dimeric and oligomeric SH3 proteins can interact in a complex network with the PRMs of Las17 and Vrp1, resulting in highly cooperative binding. The partial rescue of function when end3C is fused to Bzz1, Rvs167, or Myo5 (Figure 5B), supports the notion that these proteins promote interactions that concentrate key actin assembly factors at endocytic sites. Cooperativity in binding of multivalent proteins would greatly increase the robustness of the network and could promote actin nucleation activity (discussed further in the following section), facilitating the rapid recruitment and activation of the endocytic actin machinery (Figure 8A). Interestingly, the proteins mentioned here are well conserved in mammals (Cheng et al., 2012; Merrifield and Kaksonen, 2014) and other organisms (Lam et al., 2001; Sirotkin et al., 2005; Xin et al., 2013), indicating that multivalent PRM-SH3 network formation centered around WASP and WIP may be a general feature in spatiotemporal control of Arp2/3 complex-mediated actin assembly. Endocytic actin nucleation mainly depends on the yeast WASP (Las17) and the type 1 myosin-WIP complex (Myo3/5-Vrp1) (Galletta et al., 2008; Lewellyn et al., 2015; Sirotkin et al., 2005; Sun et al., 2006). Previous in vitro data suggest that Las17 NPF activity is constitutive (Feliciano and Di Pietro, 2012; Rodal et al., 2003). Vrp1 is required for Myo3/5 recruitment and NPF activation (Sirotkin et al., 2005; Sun et al., 2006). However, since Las17 and Vrp1 arrive at endocytic sites 15–20 s prior to actin assembly and Myo3/5 recruitment, the mechanism that controls the onset of Arp2/3 activation in vivo has been mysterious. Our quantitative analysis of Las17 and Vrp1 recruitment in different genetic backgrounds provides several important new insights into NPF-mediated actin nucleation regulation by Las17 and Myo3/5-Vrp1 in vivo. Las17 NPF activity does not trigger immediate actin nucleation at endocytic sites even when we genetically disable Las17 inhibition by Sla1 in live cells (Figure 5D). Co-existence of Vrp1 and type I myosin at endocytic sites is not sufficient to induce actin assembly until Las17 and Vrp1 levels rise to an apparent threshold level (Figure 7D). Thus, in contrast to what was previously assumed based on in vitro studies (Feliciano and Di Pietro, 2012; Rodal et al., 2003; Sirotkin et al., 2005; Sun et al., 2006), the Las17 NPF and the Vrp1-dependent type I myosin NPF activities do not appear to be active when present at low concentrations. Importantly, our quantitative analysis strongly suggested that productive actin assembly initiation is tightly coupled to accumulation of a threshold concentration of Las17 and Vrp1 at endocytic sites (Figure 5G–5I and Figure 8). Furthermore, the actin assembly rate appears to be very similar irrespective of how and when Las17 and Vrp1 are recruited to endocytic sites at sufficient levels, and assembly appears to be ‘all or nothing’ (Figure 6E), leading us to propose a ‘switch-like’ activation mechanism. Previous studies proposed a hierarchical model for N-WASP NPF activation: allostery and dimerization, which control accessibility and affinity of the N-WASP VCA for the Arp2/3 complex, respectively (Higgs and Pollard, 2000; Padrick et al., 2008; Padrick and Rosen, 2010; Rivera et al., 2009). Our results provide support for a similar mechanism in cells. Las17 does not appear to contain a G protein binding domain, and its NPF activity is not auto-inhibited. Therefore, Las17 does not depend on allosteric control to gain ‘basal’ NPF activity, explaining previous in vitro results (Feliciano and Di Pietro, 2012; Rodal et al., 2003). However, our results suggest that the ‘basal’ Las17 NPF activity is not sufficient to trigger actin assembly unless Las17 and Vrp1 are concentrated to a threshold level in vivo. We suggest that multivalent PRM and SH3-domain interactions between Las17, Vrp1 and their binding partners (discussed in the previous section), at endocytic sites induces formation of a higher-order complex, in which two or more VCAs are brought together to enhance affinity for the Arp2/3 complex. Consistently, previous studies using whole cell exacts found that Las17 is part of a large and biochemically stable complex (Feliciano and Di Pietro, 2012; Soulard et al., 2002). In our proposed scenario, Las17 and Vrp1 accumulate at endocytic sties to a threshold level and their PRMs provide a high local concentration of multivalent interactions through which Myo3 and Myo5 are also recruited and activated in an ‘all or nothing’ manner. Thus, Las17 NPF activation and Vrp1-dependent Myo3/5 recruitment and NPF activation are triggered simultaneously, creating a burst of actin filament assembly, upon which the Myo3/5 motor domains can exert forces, collectively generating forces required for endocytic membrane invagination and membrane scission. The relationship between Las17 and Vrp1 recruitment and the switch-like onset of actin assembly we observe in live cells is consistent with a mechanism based on in vitro studies in which multivalent SH3-domain and PRM interactions induce a phase transition centered around N-WASP to promote local actin assembly (Banjade and Rosen, 2014; Li et al., 2012). We speculate that the cytoplasmic WASP-Myosin module puncta propelled by actin comet tails observed when endocytic site formation is uncoupled from actin assembly (Pan1-End3 depleted cells [Sun et al., 2015] or sla1W41AW108A pan1∆PRD cells [Figure 4F]) is triggered by multivalent SH3-domain and PRM interactions in the cytoplasm. Consistently, removing multi-PRM-containing proteins (Las17 or Vrp1) from the cytoplasm, completely suppressed cytoplasmic WASP-Myosin module puncta formation and assembly of associated actin comet tails (Figure 5C–F). Overall, our results strongly support a model in which accumulation of WASP and WIP to a threshold level at endocytic sites establishes a robust, multivalent SH3 domain-PRM interaction network (possibly involving a transient phase separation [Banjade and Rosen, 2014; Li et al., 2012]), which triggers the onset of actin assembly in a switch-like manner in vivo. It is certainly possible that the other factors, such as lipids and other endocytic modules involved in endocytic site establishment or cargo loading, also influence the network and actin assembly onset. Future efforts need to assess how such factors cooperate with WASP and WIP to facilitate productive endocytic actin assembly. Yeast strains were grown in standard rich media (YPD) or synthetic media (SD) supplemented with 0.2% Casamino acids. The yeast strains are listed in Supplementary file 1. GFP, mCherry, RFP, TagRFP-T and end3C tags were integrated at the C-terminus of each gene as described previously (Lee et al., 2013; Longtine et al., 1998). Fluorescence microscopy was performed using a Nikon Eclipse Ti microscope (Nikon Instruments, Melville, NY) controlled by Metamorph (Molecular Devices, Sunnyvale, CA), equipped with a Plan Apo VC 100×/1.4 Oil OFN25 DIC N2 objective (with Type NF immersion oil, Nikon), a Perfect Focus System (Nikon), and a Neo sCMOS camera (Andor Technology Ltd., South Windsor, CT) (65 nm effective pixel size). For live cell imaging, cells were grown to early log phase at 25˚C. The cells in synthetic media were adhered to the surface of a concanavalin A coated (0.1 µg/ml) coverslip. All imaging was done at room temperature. For single-channel live cell imaging, images were acquired continuously at 1 frames/sec. Two-channel movies were made using the SPECTRA X Light Engine (Lumencor, Beaverton, OR) for excitation with a 524/628 nm dual-band bandpass filter for GFP/mCherry emission (Brightline, Semrock, Lake Forest, IL). Time to acquire one image pair is 1.1 s, or 1.3 s, or 1.8 s depending on the signal intensity. For multifocus imaging of Sac6-GFP labeled actin comet tails, images were acquired continuously at 4 frames/sec using multifocus microscopy (MFM) as described previously (Abrahamsson et al., 2013). Image J software was used for general manipulation of images and movies, for preparing kymographs, and for data analysis and quantification. For the detailed analysis procedure, please see Figure 1—figure supplement 2 and Figure 2—figure supplement 1. For patch lifetimes, unless otherwise stated, more than 100 patches were measured for each variant. Patches that at any point in their lifetime were too close to another patch to be clearly resolved were excluded from our analysis. For the fluorescence intensity profile, at least 10 patches were measured for each variant. These sample sizes are more than what has been used in other landmark papers in this type of study (Bradford et al., 2015; Kaksonen et al., 2003; Newpher et al., 2005). For each pair of variables, pooled data of analysis were compared by a two sided Mann-Whitney test using the Prism 7 graphing software. Lucifer Yellow uptake assay was also done as previously described (Sun et al., 2006). Cells were grown to early log phase in YPD media. Approximately 1 × 107 cells were pelleted and resuspended in 90 μl of YPD and 10 μl of 40 mg/ml Lucifer yellow CH dilithium salt. Cells were incubated for 90 min at room temperature and then washed four times in ice-cold 50 mM potassium phosphate buffer, pH 7.4, containing 10 mM NaN3 and 10 mM NaF. Cells were then imaged at room temperature. The Journal of Cell Biology 141:1357–1370. Molecular Biology of the Cell 18:2893–2903. Molecular Biology of the Cell 26:1371–1385. Molecular Biology of the Cell 23:2891–2904. The Journal of Cell Biology 154:1209–1224. The Journal of Cell Biology 148:353–362. Molecular Biology of the Cell 23:4256–4272. The Journal of Cell Biology 150:1311–1320. Cellular and Molecular Life Sciences 65:2128–2137. The Plant Cell Online 13:2499–2512. Journal of Cell Science 129:1531–1536. The Journal of Experimental Medicine 194:1777–1787. Journal of Cell Science 129:2689–2695. Cold Spring Harbor Perspectives in Biology 6:a016733. Biochimica Et Biophysica Acta (BBA) - Molecular Cell Research 1793:825–835. Trends in Cell Biology 20:650–661. The Journal of Cell Biology 170:637–648. Molecular and Cellular Biology 22:7889–7906. Molecular Biology of the Cell 26:3841–3856. Nature Reviews Molecular Cell Biology 8:37–48. Molecular and Cellular Biology 20:12–25. Cell Host & Microbe 14:242–255. Thank you for submitting your work entitled "WASP recruitment to a threshold level by multivalent linker proteins leads to switch-like Arp2/3 activation in vivo" for consideration by eLife. Your article has been reviewed by three peer reviewers, one of whom, (Pekka Lappalainen) (Reviewer #1) is a member of our Board of Reviewing Editors and a Senior Editor. All three reviewers found the data of very good technical quality and stated that your study provides interesting new insights into the protein network that recruits nucleation-promoting factors to the site of endocytosis. However, they also felt that the most important and novel conclusion of the study, concerning the dependence of actin filament assembly in an 'all or nothing' manner on Las17/WASP accumulation beyond a threshold level, is not sufficiently well supported by the data presented. Thus, an extensive amount of additional work would be required to address this point. Because our policy is that a revision is invited only when it can be carried out in two-three months, we cannot offer to publish this work in eLife. Reviewer #1 and #3, however, provide some suggestions for testing this hypothesis e.g. by using a mutant version of Myo3/5, and/or by manipulating the Las17 expression levels in ectopic structures in a Sla1W41AW108A:pan1delPRD background. There are certainly also other ways to test the hypothesis by making use of various genetic approaches and mutant versions of nucleation-promoting factors. Therefore, if you can provide much stronger support for the 'threshold hypothesis' or reveal an alternative mechanism responsible for the switch-like behavior of actin assembly onset, we would be glad to consider a new submission on this topic for publication in eLife. In this case, the new submission would be most likely evaluated by the three original reviewers. The mechanisms by which budding yeast WASP (Las17) and type I myosin (Myo3/5) nucleation-promoting factors (NPFs), together with a large array of scaffolding proteins, induce actin filament assembly at the sites of endocytosis are incompletely understood. Here, Sun et al., demonstrate that SH3 and poly-proline domain containing scaffolding proteins have overlapping roles in recruiting NPFs to the sites of endocytosis, and that the requirement of several linker proteins can be bypassed by expression of Las17 or Vrp1 fused to the C-terminal domain of the End3 (and thus artificially recruiting these proteins to the sites of endocytosis). Finally, the authors provide evidence that actin filament assembly is initiated only after Las17 has accumulated beyond a threshold level. This study provides interesting new insights into the protein interplay regulating actin filament assembly during endocytosis. Especially the experiments demonstrating that endocytic proline-rich and SH3 domain proteins generate a robust interaction network to orchestrate actin assembly are interesting and convincing. However, in my opinion additional experiments are required to test the hypothesis where 'WASP threshold level' provides a switch-like behavior for actin assembly onset at the sites of endocytosis. 1) The authors propose a model where actin filament assembly in an 'all or nothing' manner is dependent on Las17 accumulation beyond a threshold level (and propose that releasing Las17 from an inhibitory complex does not induce rapid actin filament polymerization at the late stages of endocytosis). However, the authors should provide stronger evidence for this model and/or consider and test alternative hypotheses for the timing of actin assembly onset. From the data presented in the manuscript and earlier publications, it seems that also Myo3/5 recruitment coincides with rapid actin assembly at the sites of endocytosis. Would it be possible that Myo3/5 activates Las17? This could be studied e.g. by using a mutant version of Myo3/5, where the NPF activity is abolished. The authors could for example test whether the NPF activity of Myo3/5 is essential to trigger actin assembly in sla1W41AW108A background (if this is indeed the case, it would provide additional support for the model presented by the authors). Moreover, one could examine whether a Myo3/5 NPF mutant displays genetic interactions with sla1W41AW108A. Also any information concerning the mechanism by which Myo3/5 is rapidly recruited to the sites of endocytosis at the stage when actin assembly is triggered would significantly improve this study. 2) In my opinion, the genetic data presented in the manuscript implies that Pan1 does not interact with Sla1 in cells, but instead suggest that End3 interacts with Sla1 and recruits Sla1 and Las17 to the sites of endocytosis. This is also supported by the data presented in Figure 5 demonstrating that the Sla1 function in recruitment of Las17 can be bypassed by expressing Las17-end3C fusion protein. This could perhaps be clarified in Figure 7. Using live cell imaging and quantitative analysis of a series of Sla and Pan1 mutants together with a number of GFP/RFP tagged markers (Las17, Vrp1, Myo5 and Abp1) the authors further explore the mechanisms regulating Las17-dependent actin polymerization during yeast endocytosis. The authors uncover that the first two SH3 domains of Sla1 and the PRD of Pan1 are not required for their recruitment to endocytic sites but are essential for productive Las17-dependent actin polymerization during endocytosis. The authors provide evidence that the first two SH3 domains of Sla1 are required for the correct temporal recruitment of Las17 to ensure actin polymerization is coupled to endocytosis. Their quantitative analysis also suggests that the PRD of Pan1 and additional proteins contributes to the correct temporal recruitment of Las17. In the absence of the first two SH3 domains of Sla1 and the PRD of Pan1 the Las17-Myosin module proteins are not recruited to endocytic sites and actin assembly is uncoupled from endocytosis. Using a Las17-end3C hybrid the authors show that artificially directing Las17 to endocytic sites independently SH3 and PRD motifs is sufficient to rescue endocytosis and cell growth. Moreover, by performing quantitative two color imaging of endocytic patches the authors show that actin polymerization (recruitment of Abp1-RFP) is initiated once Las17 reaches a threshold of 70-80% of its maximum value. Based on this the authors suggest Las17 regulates actin nucleation during endocytosis in a switch like manner. Overall the data and analysis is very thorough and supports the authors' conclusions although I'm not sure I would say this is a switch per se. A similar dose response in promoting N-WASP dependent actin nucleation also appears to be operating in other systems including artificial Nck clusters (see papers from Bruce Mayer lab) and Vaccinia actin tail formation (Figure 3 Humphries et al., JCS 2014). This should probably be mentioned. In subsection “A WASP-end3C chimeric protein restores normal growth when SH3 and proline rich domains of multivalent endocytic linker proteins are absent.” the authors say that Las17 central PRD domain contains 20 potential SH3 binding sites. A similar situation exists for N-WASP and yet only two sites are capable of binding the three SH3 domains of Nck (Donnelly et al., Current Biology 2013). Moreover, the same is true for WIP (Vrp1). Furthermore, N-WASP is not recruited through interaction of its PRD domain with the SH3 domain of Nck but by virtue of its association with WIP. It is also possible to recruit N-WASP to Vaccinia virus without inducing its activationand actin polymerization. These data using Vaccinia would suggest that SH3/PRD interactions in protein networks in cells maybe more specific and constrained than the number of predicted binding sites would suggest. It is worth also mentioning that many of the in vitro assays looking at multivalent SH3/PRM interactions also lack spatial constraints such as would be occurring in yeast actin patches. Random associations between multivalent SH3/PRM motifs would presumably not result in a switch like behaviour and the recruitment of Abp1 when Las17 is at 70-80% of its maximum intensity, but a broad range of values over different time scales. The authors might like to comment on this? It is striking that Vrp1-end3C is as effective as Las17-end3C in rescuing actin polymerization and endocytosis in the absence of SH3 and PRD motifs (Figure 5). This raises the question whether Sla1 and Pan1 are interacting with Vrp1 to recruit Las17 to endocytic sites or whether Las17 is recruited directly and Vrp1 comes along for the ride. The authors should provide temporal information of the patch fluorescent intensities for Vrp1-end3C (as shown in Figure 5B for Las17-end3C, which is currently down as unpublished in discussion). It might also be possible using the right mutants of Las17/Vrp1 to determine who is recruiting who in the system. The manuscript presented by Yidi Sun and coworkers describes a collection of nicely performed experiments with clear results, showing that, 1) combined mutation of the SH3 domains of Sla1 and the poly proline domain (PRD) of Pan1 completely uncouple actin polymerization by the endocytic WASP/Myo module from the endocytic coat, and that, 2) the strong endocytic defects installed in the sla1W41AW108A pan1∆PRD mutant can be rescue by fusion proteins of the End3 C-terminal domain with either the yeast WASP or WIP homologues Las17 or Vrp1, respectively. Even though the experiments are well performed, these results do not represent a major advance in the field with respect to what the same authors or others already published. Thus, for example, the group of D. Drubin published in 2015 an interesting paper where they demonstrated that depletion of End3 and Pan1 causes uncoupling of actin polymerization from the endocytic coat, by a failure to recruit Sla1. Also, the role of the Sla1 SH3 domains recruiting Las17 has already been described by the group of Di Pietro, and the interaction between the PRD of Pan1 and the other major endocytic actin nucleating promoting factor (Myo5) has been described by the group of B. Wendland. Probably being aware of this fact, the authors center the main conclusion of the paper (evident in the title) on a model that proposes that oligomerization of the WASP/Myo module at endocytic sites to a certain threshold level is the trigger for actin polymerization, as opposed to a mechanism where Las17 and Myo5 activities are modulated by other endocytic proteins, lipids or posttranslational modifications. This conclusion is mostly based in figure 6E, which shows that actin polymerization at endocytic sites is triggered when the Las17 signal reaches about 80% of its maximum intensity both in wild type cells expressing Las17-GFP or in cells expressing the Las17-End3C-GFP in the sla1W41AW108A pan1∆PRD background. This conclusion is very interesting but also very preliminary and would certainly need reinforcement by showing a tight correlation between the Las17 threshold and actin polymerization. The authors could for example test if direct linking of Las17 to the early module components (Ede1, Apl1, clathrin…..) initiates actin polymerization before cargo loading. Most convincingly, the authors could artificially recruit Las17 to an ectopic structure with an inducible system, to show that actin polymerization is triggered at the same threshold as in endocytic sites. If this is the case, the experiment would discard a direct modulation of the Las17 or Myo5 activities by other endocytic coat components in the sla1W41AW108A pan1∆PRD background. Experiments showing oligomerization of Las17 in vivo would also strongly reinforce the model. Thank you for submitting your article "Switch-like Arp2/3 activation upon WASP and WIP recruitment to a threshold level by multivalent linker proteins in vivo" for consideration by eLife. Your article has been reviewed by three peer reviewers, one of whom, Pekka Lappalainen (Reviewer #1) is a member of our Board of Reviewing Editors and Anna Akhmanova as the Senior Editor. The following individual involved in review of your submission have agreed to reveal their identity: Michael Way (Reviewer #2). 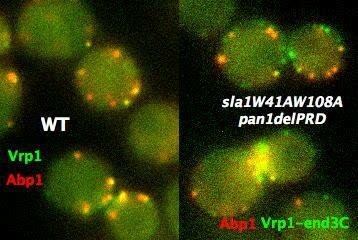 This study provides interesting new insights into the interactions between Pan1, Sla1, WASP (Las17), and WIP (Vrp1) as well as their effects on actin assembly in yeast cells. Sun et al., demonstrate that functional SH3 domains of Sla1 and the proline-rich domain of Pan1 are critical for recruiting the WASP/Myosin-1/WIP actin polymerization module to the sites of endocytosis, and that disruption of these interactions results in formation of cytoplasmic, non-productive actin comet tails. Moreover, they show that restoring the WASP or WIP localization to the sites of endocytosis using various engineered fusion proteins (where either WASP, WIP or selected endocytic SH3/proline-rich proteins were fused to the C-terminal region of End3) can redirect actin assembly to endocytic sites in cells lacking the functional SH3 domains of Sla1 and proline-rich domain of Pan1. Finally, the new version of manuscript also provides evidence that actin assembly at endocytic sites may be triggered upon recruitment of WASP and WIP to a threshold level due to multivalent SH3 domain – polyproline interactions. Although all three reviewers found the manuscript significantly improved, they felt that an additional control experiment and significant revision of the text are required before this manuscript is acceptable for publication. 1) This manuscript demonstrates that initiation of actin assembly at the sites of endocytosis correlates well with the WIP/WASP levels (in wild-type and mutant yeast strains). However, this is only a correlation and the study does not provide definitive proof that accumulation of WASP/WIP above the 'threshold' level indeed is solely responsible for actin assembly. Therefore, the authors should tone down this conclusion in the 'abstract' and 'discussion', and acknowledge that although their data support the WASP/WIP threshold model, also alternative/additional mechanisms may contribute the switch-like behavior of actin assembly at endocytic sites. 2) The authors should better explain the rationale of Myo5-End3C experiment presented in Figure 7. For clarity, they should also examine whether the NPF activity is retained in the Myo5-ENd3C protein (this could be tested by expressing it in a myo3D/myo5D/las17-WCAD strain to check functionality of this particular biochemical activity in vivo). We thank Dr. Lappalainen for finding that our work is interesting and convincing. In our revised manuscript, we have followed your advice and have added substantial amounts of new data to further support our proposed model. In addition to Las17, Myo3/5 is another major NPF, which requires Vrp1 (yeast WIP) for its recruitment and NPF activity. In the revised manuscript, we addressed how Vrp1-dependent Myo3/5 NPF activity is involved in the onset of endocytic actin assembly. Our new data show that when cortical localization of either Las17 or Vrp1 is restored through an end3C fusion, the other appears to get recruited simultaneously and restore normal cell growth and productive endocytic actin assembly in sla1W41AW108A pan1ΔPRD cells (Figure 5 and 6). In sla1W41AW108A pan1ΔPRD cells, Las17-end3C-GFP and Vrp1-mCherry, or Vrp1-end3C-GFP and Las17-TagRFP-T, respectively, develop fluorescence intensity together with identical kinetics at cortical patches (Figure 6A and Figure 6—figure supplement 1A and 1B). In addition, we provided additional quantitative analysis (Figure 5G-5I) to demonstrate that accumulation of both Las17 and Vrp1 at endocytic sites to an apparent threshold level is tightly coupled to the onset of actin assembly in wild-type cells and in sla1W41AW108A pan1ΔPRD cells. Thus, our results suggest that a threshold accumulation of both Las17 and Vrp1 predicts the onset of actin nucleation, as well as Myo3/5 recruitment, in a switch-like manner. In other words, our new results suggest that the threshold level of Vrp1 triggers Myo3/5 recruitment in a switch-like manner. Moreover, our genetic studies showed that Vrp1 or Las17 is required for Las17-end3C or Vrp1-end3C, respectively, to restore normal growth of sla1W41AW108A pan1ΔPRD (Figure 6B). 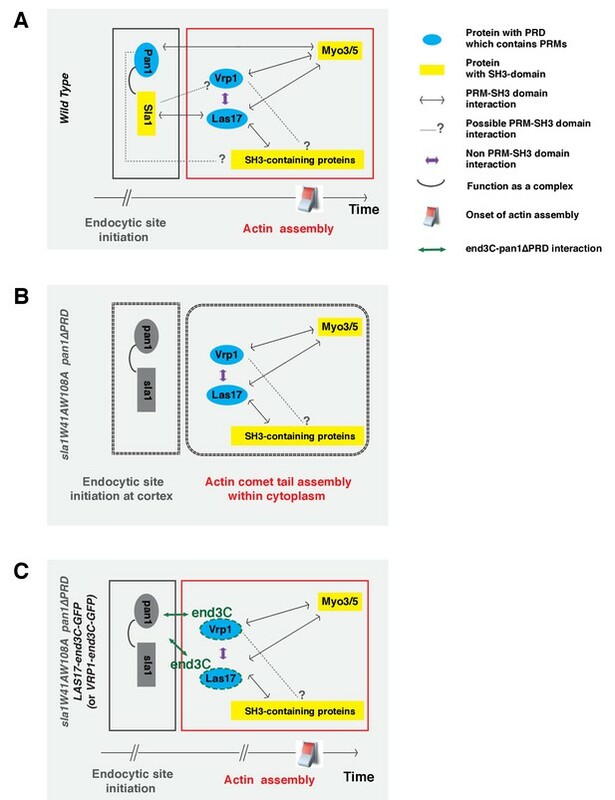 In sla1W41AW108A pan1ΔPRD cells, in which scaffolding protein interactions have been surgically eliminated, (artificial) recruitment of Las17 and Vrp1 to endocytic sites is necessary and sufficient to restore productive endocytic actin assembly at cortical endocytic sites upon reaching a threshold level. Based on previous studies, Myo3/5 do not appear to be required for activating Las17’s NPF activity. This is because the timing of the actin assembly is not affected in the myo3Δ myo5Δ cells or in myo5-CAΔ myo3Δ cells (Sun et al., 2006 Figure 3A). In addition, sla1Δ does not show a synthetic interaction with myo5CAΔmyo3Δ (Figure 1—figure supplement 1B), and actin assembly still occurs in an sla1Δ myo5CAΔmyo3Δ mutant (our unpublished data), further indicating that Myo3/5 NPF activity is not required for actin assembly by Las17 in the absence of Sla1. Most significantly, we altered the arrival kinetics of Myo5 at endocytic sites by fusing Myo5 to end3C (Figure 7). Myo5-end3C-GFP is recruited (through end3C-Pan1 interaction) to endocytic sites much earlier with a longer lifetime, which is similar to Las17 and Vrp1 (Figure 7A). However, in sharp contrast to the situation in wild-type cells, actin assembly is not triggered coincident with Myo5 recruitment or during the first 12.6 ± 4.9 sec of the Myo5-end3CGFP lifetime (Figure 7C), even though Myo5-end3C and Vrp1 (as well as Las17) are all present at cortical patches (Figure 7A). Instead, the onset of actin assembly still occurred when Las17 and Vrp1 accumulated to the levels at which actin assembly is observed in wild-type cells. 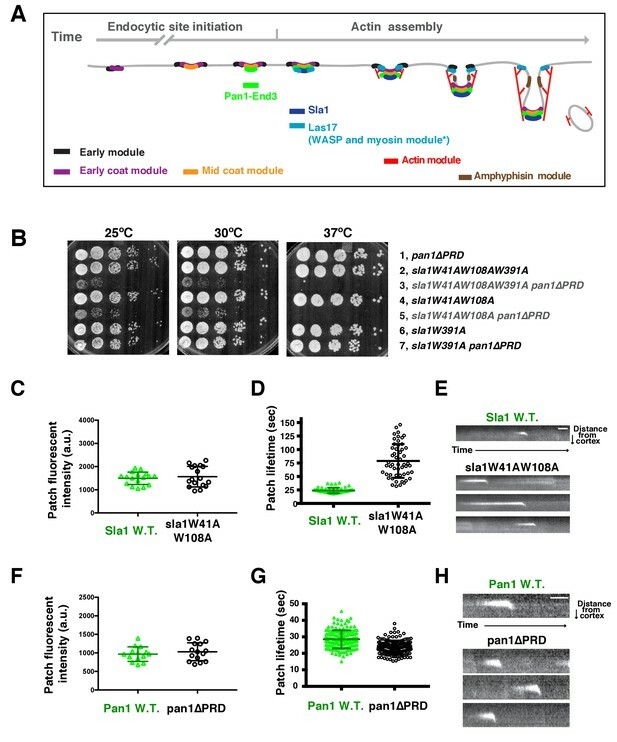 These data using engineered variants with altered recruitment timing show that the arrival of Myo3/5 at endocytic sites is not sufficient to activate Las17 NPF activity and instead strongly support a model in which recruitment of Las17 and Vrp1 to a threshold level triggers actin assembly. We propose that in wild-type cells Las17 and Vrp1 are recruited to a threshold level via a robust interaction network involving PRMs and SH3 domains, achieving a high local concentration of the key actin-nucleating proteins. 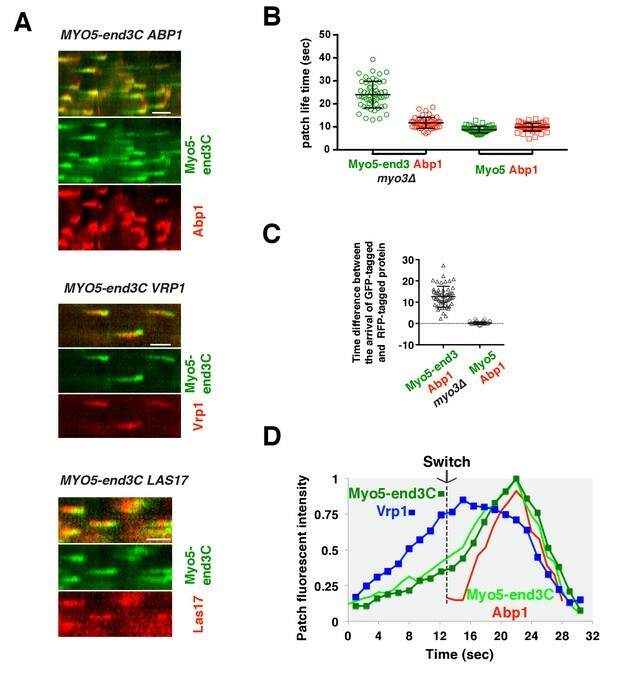 Once recruited to a threshold level, Las17 NPF activation, Vrp1-dependent Myo3/5 NPF activation, and Myo3/5 motor activity collectively generate forces required for endocytic membrane invagination and membrane scission. Previous studies from other labs and our lab established that Pan1 and End3 coexist in a stable complex, that Sla1 is recruited to endocytic sites through this Pan1-End3 complex and that End3 plays a crucial role through interactions of its N-terminus (Boeke et al., 2014; Sun et al., 2015). Meanwhile, Pan1 plays an apparently redundant role in Sla1 recruitment. Thus, Pan1, End3, and Sla1 function as a complex at the endocytic sites. We have modified the text and model figure to provide more clarity about what has been established in the field based on evidence from multiple labs. We thank Reviewer #2 for finding that our work is very thorough and supports our conclusions. We regret that we did not do a better job referencing previous relevant research comprehensively. We hope to have fixed the problem in this revised manuscript. Our quantitative analysis now demonstrates that actin assembly initiation is tightly coupled to an apparent threshold level of the two proteins Las17 and Vrp1 (Figure 5 and Figure 6), yeast WASP and WIP. Furthermore, once Las17 and Vrp1 reach to the threshold level in wild-type cells or in the sla1W41AW108A pan1ΔPRD mutant, actin assembly is induced in a very similar manner, with similar kinetics (Figure 6E). Thus, we conclude that the onset of actin assembly is not only dependent on Las17 and Vrp1 reaching a threshold level, but also that it occurs in an “all or nothing” manner. In subsection “A WASP-end3C chimeric protein restores normal growth when SH3 and proline rich domains of multivalent endocytic linker proteins are absent.” the authors say that Las17 central PRD domain contains 20 potential SH3 binding sites. A similar situation exists for N-WASP and yet only two sites are capable of binding the three SH3 domains of Nck (Donnelly et al., Current Biology 2013). Moreover, the same is true for WIP (Vrp1). Furthermore, N-WASP is not recruited through interaction of its PRD domain with the SH3 domain of Nck but by virtue of its association with WIP. It is also possible to recruit N-WASP to Vaccinia virus without inducing its activation and actin polymerization. These data using Vaccinia would suggest that SH3/PRD interactions in protein networks in cells maybe more specific and constrained than the number of predicted binding sites would suggest. It is worth also mentioning that many of the in vitro assays looking at multivalent SH3/PRM interactions also lack spatial constraints such as would be occurring in yeast actin patches. Random associations between multivalent SH3/PRM motifs would presumably not result in a switch like behaviour and the recruitment of Abp1 when Las17 is at 70-80% of its maximum intensity, but a broad range of values over different time scales. The authors might like to comment on this? The reviewer raises excellent points. We agree that it is important to gain more detailed knowledge about the multivalent SH3-PRM interaction network generated by Las17 and Vrp1 and their binding partners at both molecular and biochemical level in future. However, some information about possible binding interactions is available. In budding yeast, five PRMs of Las17 have been shown to be important for binding to Sla1 (Feliciano et al., 2012). Sla1, but not Vrp1 (Sun et al., 2006), plays key roles in Las17 recruitment to endocytic sites (this work, Rodal et al., 2003; Feliciano et al., 2012). In addition, phage-display experiments (Tong et al., 2002) generated a map showing which Las17 PRMs are able to interact with numerous binding partners specifically. On the other hand, there is much less information about the Vrp1 PRD in yeast. Nevertheless, these data indicated that Las17 and Vrp1 might not behave exactly the same as NWASP and WIP in Vaccinia virus, although similar principles may apply. In addition, the endocytic proteins that appear during the endocytic initiation phases also contain multivalent domains such as EH domains, which potentially facilitate multivalent interactions. Interestingly, these early proteins show very irregular lifetimes until Pan1-End3-Sla1 appear. Future investigations are needed to address how the “endocytic initiation phase” interaction network may affect formation of the WASP-Myosin module network. Since a very detailed spatiotemporal pathway has been elucidated for each protein recruited to endocytic sites, we are hopeful that future studies using yeast will yield more information to address the issues raised here. We fully agree that the rescue by Vrp1-end3C is quite striking and has the potential to provide additional insights into timing and recruitment mechanisms. Therefore, in the revised manuscript, we added a substantial amount of new data to investigate how the engineered Vrp1-end3C protein rescues the endocytic defect of the sla1W41AW108A pan1ΔPRD mutant. Our new data shows that when restoring Las17 or Vrp1 cortical localization through an end3C fusion, the other protein gets recruited simultaneously, and restores normal cell growth and productive endocytic actin assembly in sla1W41AW108A pan1ΔPRD cells (Figure 5 and 6). In sla1W41AW108A pan1ΔPRD cells, Las17-end3C-GFP and Vrp1-mCherry, or Vrp1-end3C-GFP and Las17-TagRFP-T, respectively, develop fluorescence intensity with indistinguishable kinetics at cortical patches (Figure 6A and Figure 6—figure supplement 1A and 1B). Thus, Las17 and Vrp1 preferentially interact with each other, and these two proteins are necessary and sufficient to organize the remaining WASP/Myosin module components at endocytic sites for productive endocytosis in the sla1W41AW108A pan1ΔPRD mutant. This analysis also supports the conclusion that a threshold accumulation of both Las17 and Vrp1 is coupled to the switchlike onset of actin nucleation. Previous studies from others and our lab found that Vrp1 appears at endocytic sites slightly after Las17 in wild-type cells, and that Vrp1 recruitment is dependent on Las17. In the future, it will be important to explore whether Sla1 also interacts with Vrp1 through PRM-SH3 domain interactions. We appreciate that Reviewer #3 found that our experiments are well performed and that our results are clear. However, we respectfully disagree with the Reviewer #3’s assessment regarding the significance of our results, given what we see as novel mechanistic insights revealed by these studies. Our previous work, which implicated Pan1, End3 and Sla1 as playing vital roles in coupling actin assembly to endoctyic sites, involved depletion of full-length Pan1 and End3 proteins from the cell. However, the mechanism governing the coupling between the endocytic machinery and the actin assembly machinery could not be addressed by such studies. This is because Pan1, End3 and Sla1 contain more than ten functional motifs that are involved in numerous protein-protein interactions with clathrin, receptors, adapters, NPFs etc. Thus, an important yet challenging task and priority was to identify the specific domain(s) required for linking actin assembly to endocytic sites. This knowledge, in turn, would provide insights into the mechanism by which the actin assembly machinery is recruited to and becomes active at endocytic sites. We point out that the same proteins, WASP, WIP and Myosin 1 are recruited to a number of different sites under different circumstances in cells to provide forces for a variety or processes. Thus, the principles learned from our careful, quantitative analysis are likely to apply very broadly. In this current work, we revealed that in cells in which Pan1’s PRMs and the two Sla1 SH3-domains have been specifically eliminated by construction of appropriate mutants, the identical actin phenotype is observed as in cells depleted for both Pan1 and End3. This is an important new finding because it provides strong evidence that Pan1 and Sla1 recruit the actin assembly machinery to endocytic sites through a set of SH3-PRM interactions. Although the interactions of Pan1 and Myo5 or Las17 and Sla1 have been described previously, loss of any of these interactions alone does not cause significant defects in endocytic actin assembly in vivo. Previous in vitroexperiments on these interactions have been interpreted as suggesting that they regulate the NPF activity of Myo3/5-Vrp1 and Las17. The assumptions that Las17 is not auto-inhibited, and that Sla1 is required to keep Las17 inhibited at the early stage of endocytic internalization, have led researchers to search for factors that relieve the inhibition of Las17 by Sla1, but without much success. In contrast, our in vivoresults indicate that the yeast WASP Las17, even without interacting with Sla1, is not as active as was previously believed. Importantly, our rescue experiments utilizing a novel end3C fusion strategy clearly suggest that the interactions of Pan1 with Myo5 or Las17 with Sla1 primarily function in protein recruitment in vivo. These results provide an explanation for why the search for factors that relieve Sla1 inhibition of Las17 have failed. Thus, our findings provide new insights into the activation mechanism for endocytic actin assembly and identify a new set of questions, advancing the general understanding of NPF activation mechanisms in living cells. Therefore, the experiments shown in the first part of our paper are novel and represent important advances in the field. Furthermore, the first part of our study also lays a strong foundation for the second part of the paper investigating the parameters that matter for triggering rapid actin assembly in vivo. In this study, we have addressed two important questions. The first part addresses how the WASP-Myosin module is concentrated at endocytic sites. We identified a novel synthetic genetic interaction between mutants of Sla1’s SH3 domains and Pan1’s PRD, and demonstrated that the actin assembly driven by proteins of the WASP-Myosin module is uncoupled from cortical endocytic sites, which are rendered nonproductive. We then developed a novel “end3C fusion” strategy to artificially recruit proteins to endocytic sites without altering expression levels of the protein being tagged. Combination of our novel “end3C-fusion” method with the newly identified SH3 domain and PRD mutants allowed us to demonstrate that the robust PRMSH3 interaction network is the key to recruitment of the actin assembly machinery to endocytic sites. The second question concerns the mechanism by which the onset of actin assembly is triggered. With a substantial number of new experiments now added to our previously reported experiments (discussed in the following section), our results provide several important new insights in NPF-mediated actin nucleation regulation by Las17 and Myo3/5-Vrp1 in vivo. Las17 NPF activity does not trigger immediate actin nucleation at endocytic sites even in the absence of the Sla1 inhibition in live cells (Figure 5D). Co-existence of Vrp1 and type I myosin at endocytic sites is not sufficient to induce actin assembly until Las17 and Vrp1 levels rise to an apparent threshold level (Figure 7D). Thus, in contrast to what was previously assumed based on in vitrostudies (Feliciano and Di Pietro, 2012; Rodal et al., 2003; Sirotkin et al., 2005; Sun et al., 2006), the Las17 NPF and the Vrp1-dependent type I myosin NPF do not appear to be active when present at low concentrations. Importantly, our quantitative analysis demonstrated that actin assembly initiation is tightly coupled to accumulation of a threshold concentration of Las17 and Vrp1 (Figure 5G-5I). Furthermore, the actin assembly rate appears to be very similar irrespective of how and when Las17 and Vrp1 are recruited to endocytic sites at sufficient levels, and assembly appears to be “all or nothing” (Figure 5 and Figure 6). Thus, Las17 NPF activation, Vrp1-dependent Myo3/5 NPF activation, and Myo3/5 motor activity are coincidentally recruited at sufficiently high local concentration to generate forces required for endocytic membrane invagination and membrane scission. Finally, it is important to note that our proposed model is not exclusive of (or opposed to) the possibilities that the WASP-Myosin module might be modulated by additional factors (interaction with other endocytic proteins, lipids or posttranslational modifications) after they are recruited to endocytic sites, in order to coordinate activities and spatially organize components for successful endocytic internalization. Our current work is not aimed to test these possibilities. We now modified the title to avoid confusion. However, the formation of cytoplasmic actin comet tails when the link between the endocytic machinery and the actin assembly machinery is broken in sla1W41AW108A pan1ΔPRD does show that the WASP-Myosin module is sufficient to initiate and sustain actin assembly in the absence of the endocytic proteins that appear at the early endocytic stage. This conclusion is very interesting but also very preliminary and would certainly need reinforcement by showing a tight correlation between the Las17 threshold and actin polymerization. We appreciate that Reviewer #3 finds that our proposed model is interesting. We now followed Reviewer #3’s advice and generated new sets of data to further strengthen our model, summarized as following. Our new data show that when cortical localization of either Las17 or Vrp1 is restored through an engineered end3C fusion, the other protein is recruited simultaneously and normal cell growth and productive endocytic actin assembly are robustly restored in sla1W41AW108A pan1ΔPRD cells (Figures 5 and 6). In sla1W41AW108A pan1ΔPRD cells, Las17-end3C-GFP and Vrp1-mCherry, or Vrp1-end3C-GFP and Las17-TagRFP-T, respectively, develop fluorescence intensity with indistinguishable kinetics at cortical patches (Figure 6A and Figure 6—figure supplement 1A and 1B). Furthermore, in the revised manuscript, we provided additional quantitative analysis (Figure 5G-5I) to demonstrate that accumulation of both Las17 and Vrp1 at endocytic sites to an apparent threshold level is tightly coupled to the onset of actin assembly in wild-type cells and in sla1W41AW108A pan1ΔPRD cells. Moreover, our genetic studies demonstrated that Vrp1 or Las17 is required for Las17-end3C or Vrp1-end3C, respectively, to restore normal growth to sla1W41AW108A pan1ΔPRD cells (Figure 6B). Collectively, our old and new results support a model in which threshold accumulation of both Las17 and Vrp1 is tightly coupled to the onset of actin nucleation as well as Myo3/5 recruitment and a burst of actin assembly, in a switch-like manner. In other words, our new results suggest that when a threshold level of Vrp1 (and Las17) is reached, Myo3/5 recruitment and actin assembly are triggered in a switch-like manner. Vrp1 is known from our previous studies and studies from other labs to be required for Myo3/5’s recruitment and NPF activity. Thus, in sla1W41AW108A pan1ΔPRD cells, (artificial) recruitment of Las17 and Vrp1 are sufficient and necessary to restore productive endocytic actin assembly by Las17 NPF activity and Vrp1-dependent-Myo3/5 NPF activity, which are triggered in a switch-like manner upon Las17 and Vrp1 reaching a threshold level. The authors could for example test if direct linking of Las17 to the early module components (Ede1, Apl1, clathrin…..) initiates actin polymerization before cargo loading. Most convincingly, the authors could artificially recruit Las17 to an ectopic structure with an inducible system, to show that actin polymerization is triggered at the same threshold as in endocytic sites. If this is the case, the experiment would discard a direct modulation of the Las17 or Myo5 activities by other endocytic coat components in the sla1W41AW108A pan1∆PRD background. It could be technically very challenging to control/monitor local accumulation of Las17 in an inducible system that artificially recruits Las17 to an ectopic structure, but we do plan to study fusion of Las17 to early pathway proteins in a future study (see below). Instead, we altered the recruitment timing of Myo3/5 (Figure 7), which is one of the two major NPFs for endocytic actin assembly, to further test our model. As expected, Myo5-end3C-GFP is recruited (through end3C-Pan1 interaction) to endocytic sites much earlier and with a longer lifetime time (Figure 7B), which is similar to Las17 and Vrp1 (Figure 7A). However, actin assembly is not triggered during the first 12.6 ± 4.9 sec of Myo5-end3C-GFP lifetime (Figure 7C), even though Myo5-end3C and Vrp1 (as well as Las17) are present at cortical patches (Figure 7A). Remarkably, in cells expressing this engineered MYO5-end3C-GFP variant, even though the relative timing of WASP, WIP and Myosin 1 are altered, the onset of actin assembly still coincides with recruitment of a threshold level of Vrp1 (Figure 7D and Figure 7—figure supplement 1). Together, these data strongly support our model that threshold levels of Las17 and Vrp1 play a decisive role in inducing switch-like NFP activation through multivalent PRM and SH3-domain interactions in vivo. The “Ede1-Las17 hybrid” idea is very interesting. However, as we mentioned above, our proposed model is not exclusive to the possibilities that the WASP-Myosin module may be modulated by other factors after they are recruited to endocytic sites in order to gain full activity for endocytic internalization. We do plan to generate Ede1-Las17 hybrid proteins to investigate these possibilities as a future study and hope to have convinced Reviewer #3 that our study is already very comprehensive and makes important advances in understanding WASP/WIP/Myosin 1-mediated actin assembly regulation in living cells. Thanks for this suggestion. Indeed, previous studies using whole cell exacts showed that Las17 forms a large and biochemically stable complex (Feliciano et al., 2012), which is consistent with our model. We have now added this reference in support our model. We agree that our data show a correlation between WASP/WIP levels and switch-like actin assembly onset, but do not definitively show causation. We apologize for writing the previous version of our manuscript in a manner that indicated that we had presented definitive evidence for causation. We have endeavored to tone down the conclusions in the Abstract and Discussion and to acknowledge the possibility that alternative mechanisms operate. Specifically, we modified the Abstract and added a paragraph at the end of the Discussion to address the reviewers’ concerns. We also made some minor changes in the Results section to summarize the conclusions in a more balanced manner. To recap some of the main advances made in this study, we set out to determine how NPFs are concentrated at endocytic sites and how the actin assembly is triggered. Whereas excellent previous studies with similar goals were largely biochemical, our studies were performed using genetics and imaging in living cells for a natural process, endocytosis. Our results provide several important new insights: 1) We established that two Sla1 SH3 domains and the Pan1 PRD together play indispensable recruitment roles in coupling the WASP-Myosin machinery to endocytic sites. 2) We showed that the WASP-Myosin machinery is recruited to endocytic sites via SH3 domain-PRD interactions, and that WASP and WIP play central roles in this recruitment. 3) We showed that the yeast WASP NPF activity at endocytic sites does not appear to be regulated negatively by Sla1, or at least not exclusively in this manner, as was previously assumed. 4. We established through careful quantitative analyses that actin assembly and Type I Myosin recruitment/activation are triggered in an “all and nothing” manner. The above results, considered in the context of results from recent in vitro studies of the Rosen lab, allow us to propose a mechanism in which WASP and WIP play central roles in establishing a robust multivalent SH3 domain-PRM interaction network at endocytic sites (likely through a transient phase separation), giving actin assembly onset a switch-like behavior in vivo. The tight correlation between reaching a threshold level (or a high level) of WASP/WIP, and actin assembly onset, provides additional strong evidenceto support our proposed model. This is because that formation of a robust multivalent SH3 domain-PRM interaction network may need WASP/WIP to attain a threshold concentration. It is possible that threshold levels of WASP and WIP are necessary but not sufficient to trigger productive endocytic actin assembly. We hope that more studies will follow ours to further examine our model and investigate how other factors cooperate with WASP and WIP to facilitate productive endocytic actin assembly. We wrote an additional paragraph to explain why we performed the Myo5-end3C experiment (subsection “Recruitment and NPF activation of type I myosin by WIP appears to occur in a switch-like manne”). We performed the suggested control experiment. MYO5-end3C las17WCA∆ myo3∆ cells grow much better than myo5CA∆ las17WCA∆ myo3∆ cells, suggesting that NPF activity is retained in Myo5-end3C. This new result is shown in Figure 5—figure supplement 2. We thank the members in Drubin/Barnes laboratory for helpful discussions. We are grateful to Matt Akamatsu for advice on image analysis and to Jonathan Wong for critically reading the manuscript. We also thank Mustafa Mir and Sara Abrahamsson for their help in implementing MFM microscopy. This work was supported by NIH grant R35GM118149 to DGD.